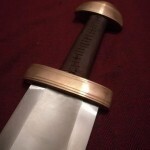 In the last months, I have been in touch with Dr. Lee Jones, the early medieval sword enthusiast and collector (http://vikingsword.com). 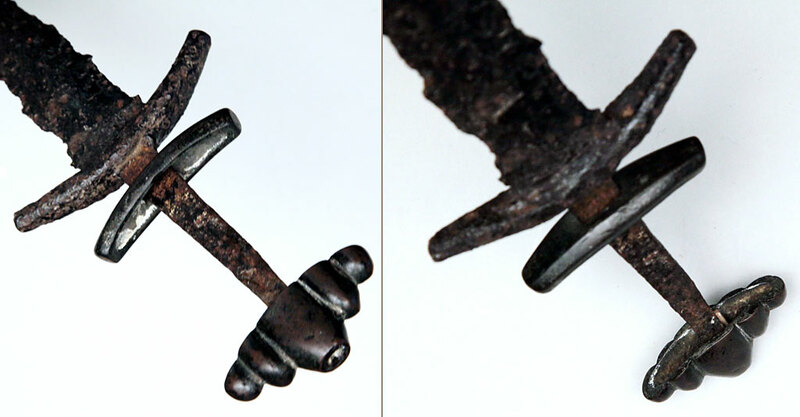 Our cooperation led to two articles published on these websites (see Private Sword with a Wooden Hilt and A Curonian Sword from a Private Collection). This time, Mr. Jones shared another interesting piece from his collection. This article will describe it, as well as the closest analogies, since it seems that the type is rather vaguely defined. 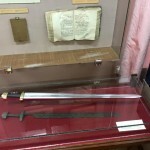 The sword owned by Mr. Jones. 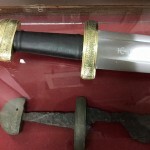 The sword, that can be seen above, belongs to Mr. Lee Jones “for several decades” and was probably bought in an auction or at Ebay as other swords in his collection. As fas as we can judge, it seems to be a genuine piece that shows the application of original technology. 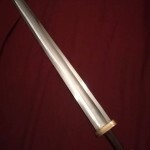 In the current state, the sword is 676 mm long and weighs 531 grams. 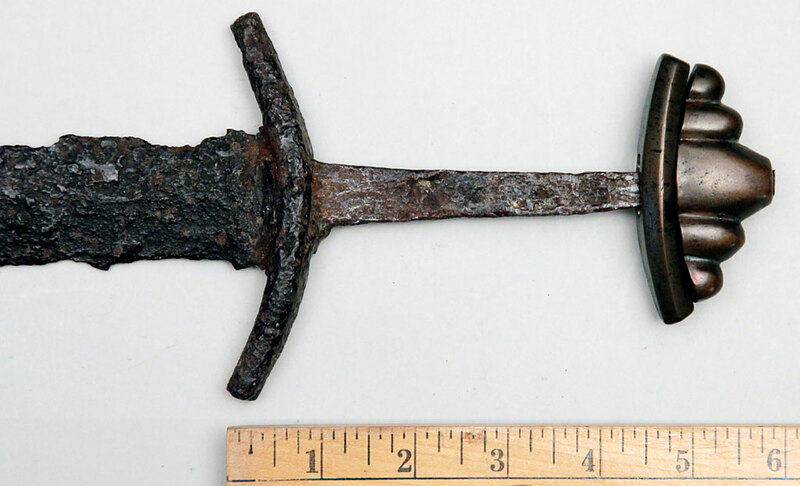 The iron blade, which is in poor condition with severe losses, is 540 mm long, 36.8-25.0 mm wide (36.8, 33.3, 29.9, 27.9, 26.8, 25.0 mm taken at roughly 100 mm intervals) and 5.2-3.5 mm thick (5.2, 6.4, 3.8, 4.7, 4.1, 3.5 mm taken at 100 mm intervals). The blade seems to be somewhat lenticular in cross section; towards the hilt the remain is thickest at the midline, proceeding towards the tip the faces of the blade become fairly flat. If the corrosion is hiding a fuller, then it must be quite shallow. 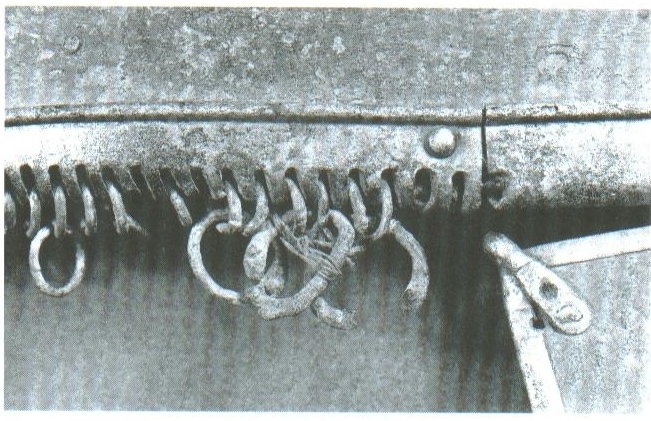 There is no evidence of pattern welding or inlays. The hilt is 136 mm long in the mid-line. 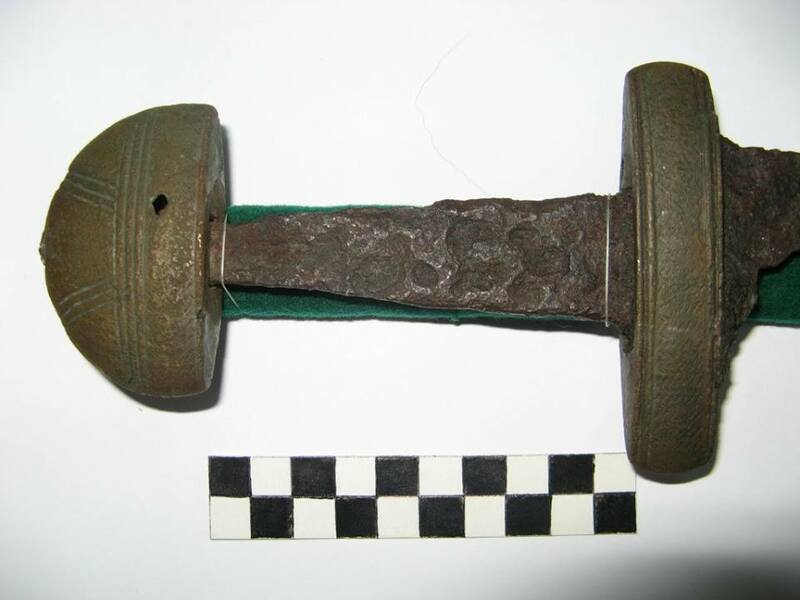 The upper part of the hilt is formed by the five-lobed pommel and adjacent upper guard that are each cast in copper alloy. As they are loose, we can see they are semi-hollow castings. The intended display surfaces are smooth and in very good condition. The pommel is 65.6 mm long, 28.9 mm high (central lobe; 19.4 and 18.6 mm for intermediate lobes, 10.8 and 10.5 mm for outer lobes) and 18.9 mm thick (central lobe; 16.4 and 16.0 mm for intermediate lobes, 13.0 and 12.2 mm for outer lobes). The thickness of the wall of the pommel varies from 2.8 to 5.0 mm at edge. The upper guard of concavo-convex shape copies the curvature of the pommel. 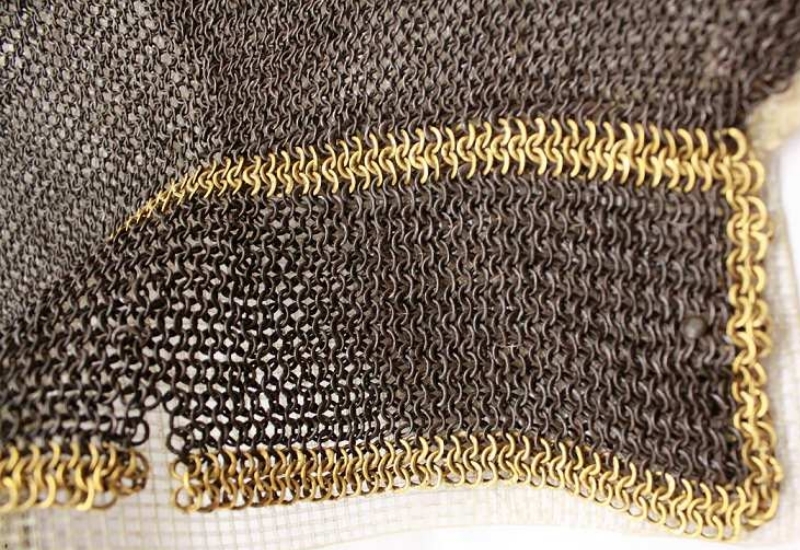 There is a raised ridge line on the surfaces of the guard. The length of the upper guard is 74.0 mm, while it’s height is 8.7 mm and the thickness 20.5 mm (central; 14.6 mm peripheral). The grip area tang shows no traces of organic material. The tang in that area is 88 mm long, 17.0-10.0 mm wide (17.0 mm at cross-guard, 12.9 mm mid, 10.0 mm at pommel) and 5.1-4.2 mm thick (5.1 mm at cross-guard, 4.9 mm mid, 4.2 mm at pommel). 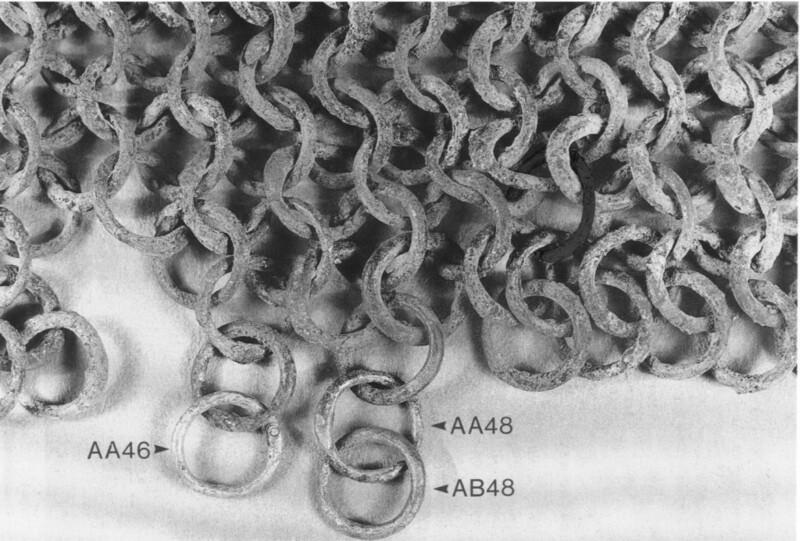 The curved, convexo-concave cross-guard is of iron showing moderate corrosion; the scale and cross section are consistent with the upper guard and in one place there is a suggestion of a ridge line. The cross-guard is 106.6 mm long. The height of the cross-guard is 24.1 mm (greatest extent including the arc), or 8.9-11.2 mm (8.9 and 9.3 mm peripheral, 11.2 mm central), if the arc is not taken in account. The thickness of the central part of the cross-guard is 17.3 mm and it continuosly tapers to 12.9 / 14.5 mm in the middle and 9.8 / 10.4 mm at the ends. The sword of Mr. Jones is quite rare and the searching for close analogies is not possible without dificulties. Especially the cast 5-lobed pommel seems to be almost absent in the literature. Before anything else, let us describe the sword from the perspective of current sword typologies. 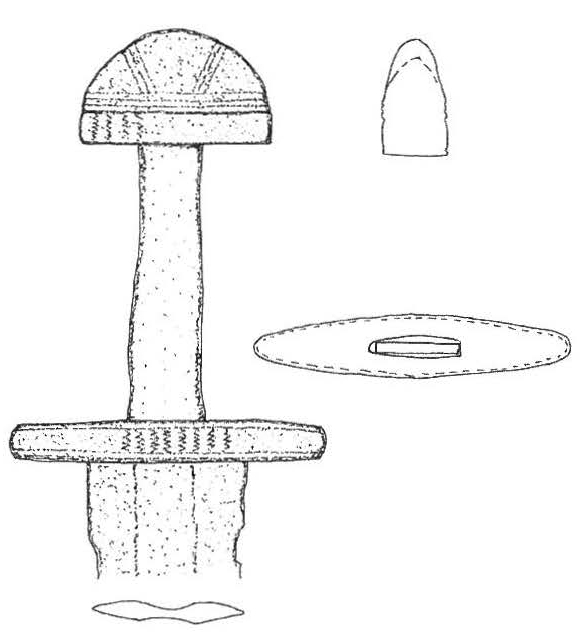 The sword type with curved guards and peened 5-lobed cast pommel is not present in Jan Petersen’s typology (Petersen 1919). However, there are some types that stand very close to the sword owned by Mr. Jones. 15 types or variants of Petersen’s typology (main types L, O, K, Q, T, X, Y, Z, Æ; special types 7, 14, 15, 16, 17, 18, 19) apply the curved cross-guards, from which at least 12 types or variants (main types L, O, P, Q, Y, Z, Æ; special types 7, 14, 15, 16, 19) use curved cross-guard and curved upper guard/pommel at the same time. At least 5 types or variants (main types L, O, Z; special types 14, 19) use curved cross-guards, curved upper guards and lobed pommels at the same time. 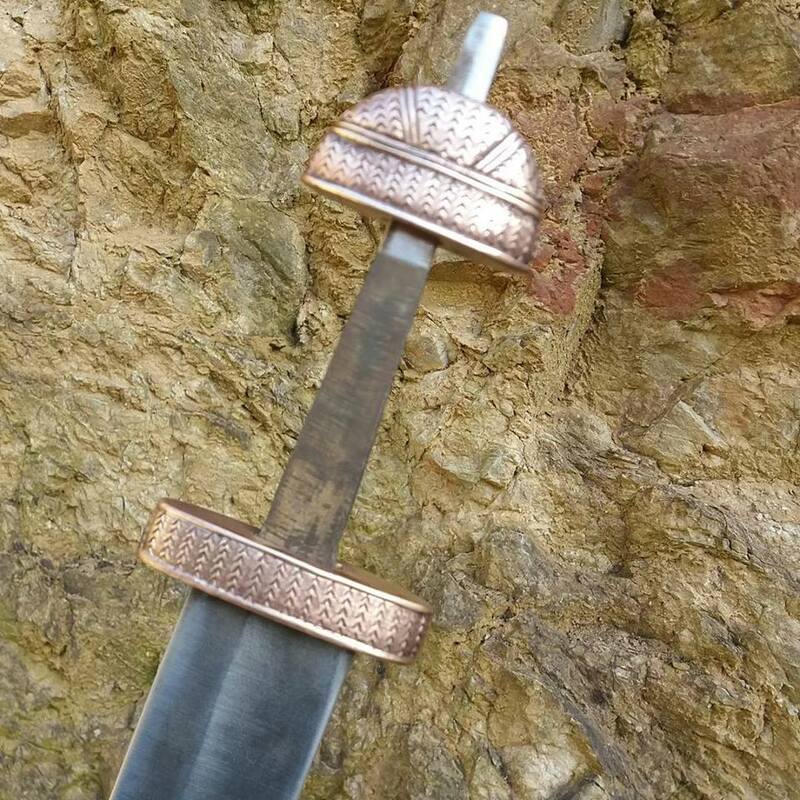 There are at least two Petersen hilt types that use components cast in copper alloy: type O and type W. At least four Petersen’s types or variants (K, O, R, S) apply 5-lobed pommels connected to upper guards by two rivets or a semicircular rivet. Specifically, a 5-lobed variant of types R and S have a very similarly looking pommel. However, none of these four types or variants uses the construction with the peened tang. From a construction point of view, the closest types are L and Z, as they use curved cross-guards, curved upper guards and lobed pommels that are sometimes peened. 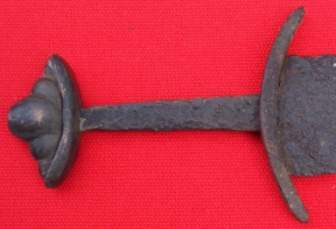 Moreover, the general shape of the pommels of these types is quite close to the pommel of the sword owned by Mr. Jones. Even there is no identical example in Scandinavia, this approach of searching for analogies tells us there was a tendency to use mentioned features in Europe of 10th and 11th century. Petersen’s typology, vizualized by Jones 2002: 18-19. 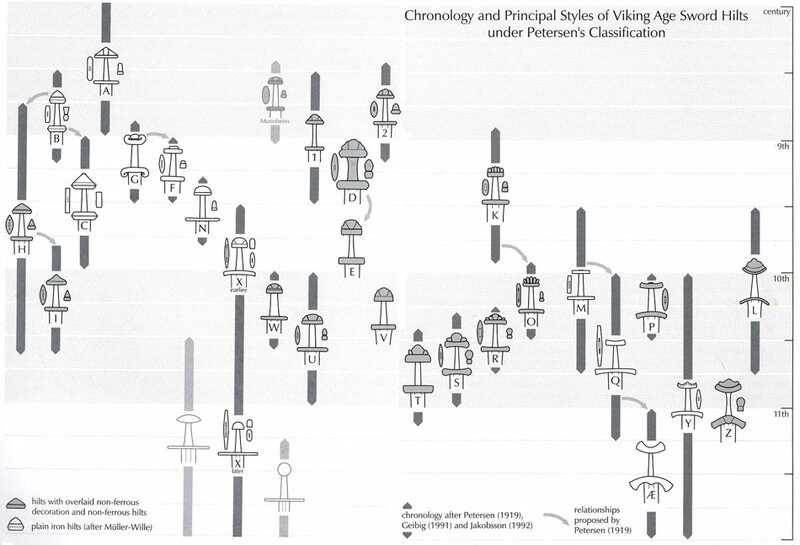 Swedish archaeologist Mikael Jakobsson (1992) arranged Petersen’s types into 6 so-called design principles, the larger groups of hilts that use the same features, and enriched Norwegian-centric Petersen with many useful distribution maps. In this context, we will mention the principle 2, 3 and 5. 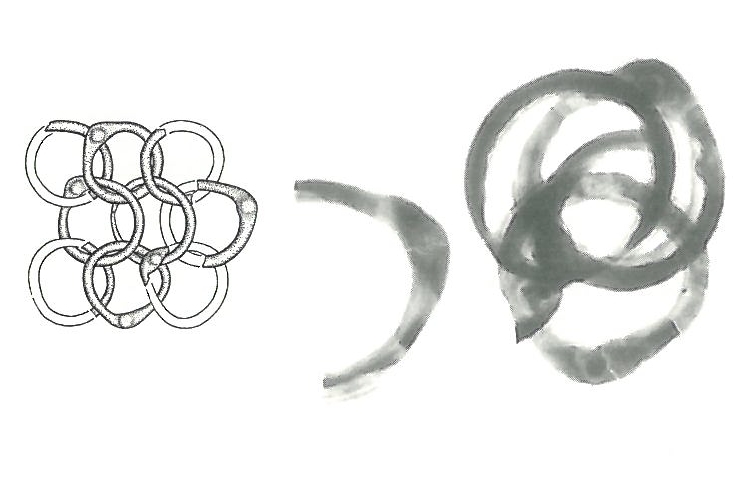 Design principle 2 represents 3-lobed pommels, including also types L and Z. According to Jakobsson, this principle can be dated between late 8th and early 11th century and it contains no less than 26% of European swords. The principle is widespread across the Europe; 37% of examples come from Norway, 12% from Sweden, 9% from Finland, 4% from Denmark, 15% from Western Europe and 23% from Eastern Europe. The principle 3 is described as a group of swords that use 5-lobed pommel. 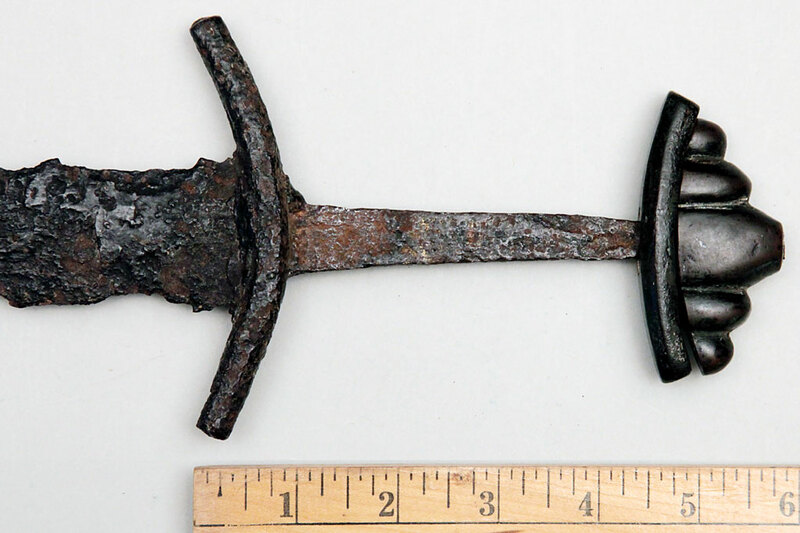 According to Jakobsson, this principe is the least frequent, counting just 5% of European early medieval swords. 49% of examples were found in Norway, 5% come from Sweden, 30% from Western Europe and 15% from Eastern Europe. 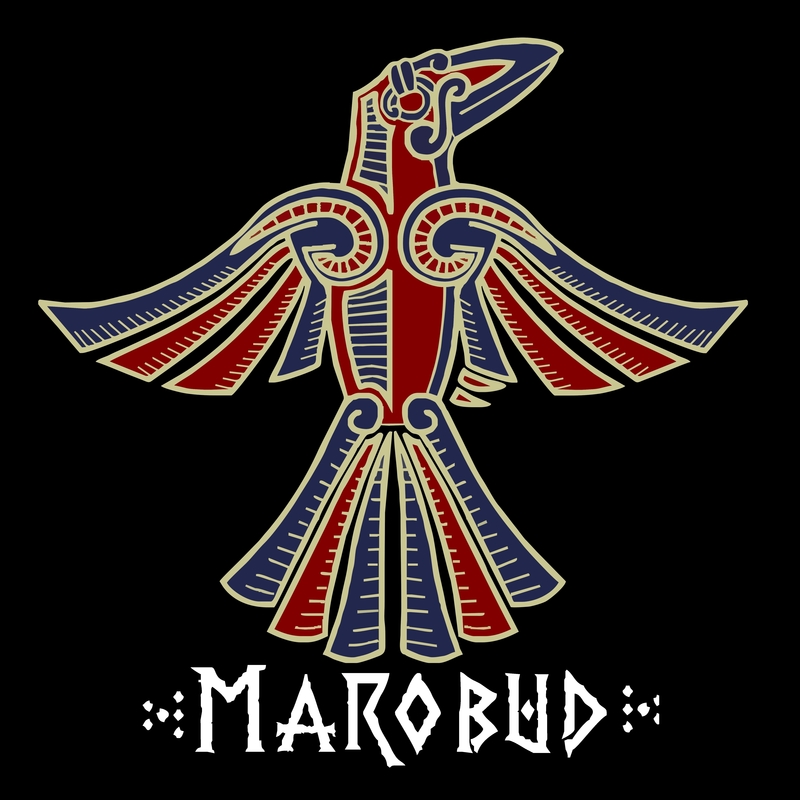 Jakobsson undestands principle 3 as a development of the principle 2 and the usage can be dated to period between early 9th and mid 10th century in Scandinavia. Design principle 5 comprises swords with curved cross-guards. 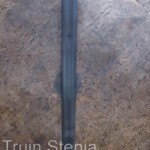 Swords with this feature represent 26% of early medieval European swords. 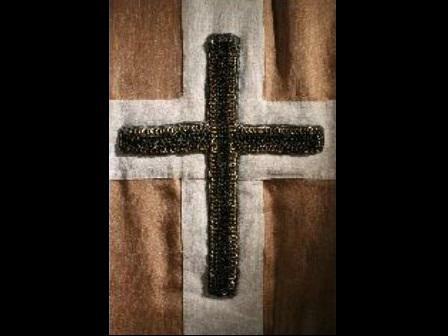 In Scandinavia, they can be dated to the period from early 9th to late 11th century. 71% of examples come from Norway, 7% from Sweden, 5% from Finland, 1% from Denmark, 10% from Western Europe and 6% from Eastern Europe. The sword of Mr. Jones can be described as a sword that belongs to design principles 3 and 5. More or less close analogies can be found in all three named categories. The advantage of Jakobsson’s work lies in the fact that he maps the bigger groups of swords within Europe. Jakobsson’s design principles, taken from Jakobsson 1992: 27, Fig. 1. In his book, Sir Mortimer Wheeler described 7 Scandinavian hilt forms that occur in Britain (1927: 31-37, Fig. 13). Even though it rather reduces the actual reality, it is still being used by British academia. The sword of Mr. Jones stands close to Wheeler’s type V and VI, which visually corresponds to Petersen’s types L and Z. 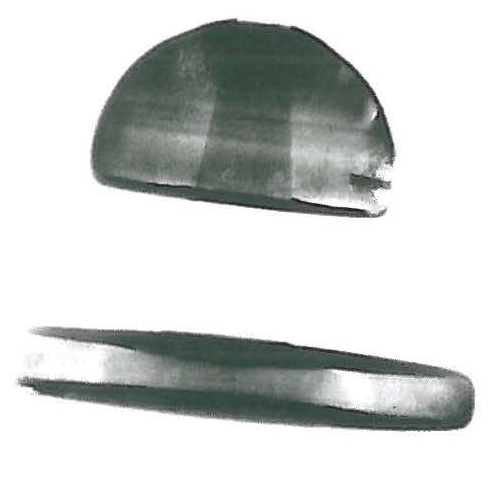 Type V is said to have very curved guards and a peened pommel with a big central lobe, while type VI has slightly curved guards and 3-lobed pommel that is riveted to the upper guard. Type V is therefore a closer choice. The final remark of this section is that swords of the British origin are imprecisely categorized, leading to the constant need of classifying uncommon swords as variants. 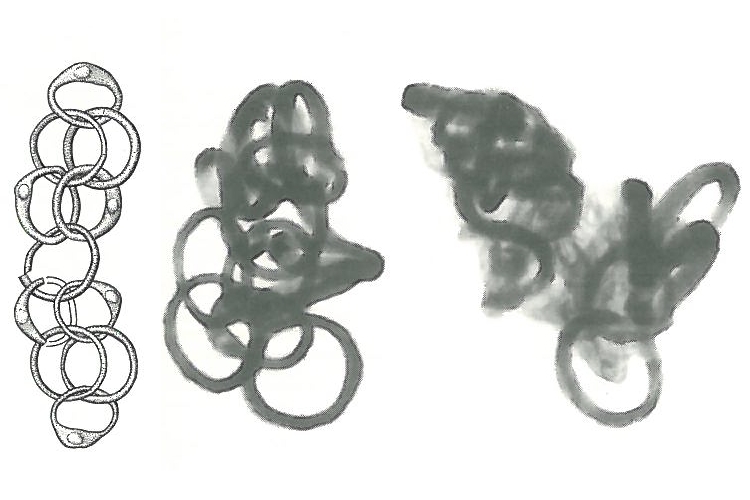 Wheeler’s typology, taken from Wheeler 1927: 32, Fig. 13. 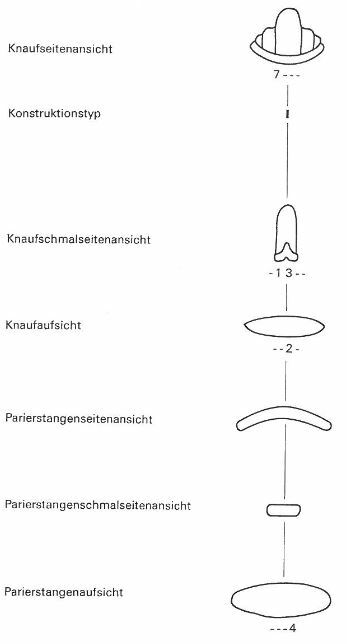 German scholar Alfred Geibig presented his study on early medieval blades and hilts in 1991 (Geibig 1991). 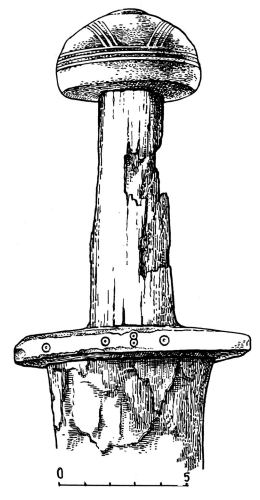 His typology of hilts, which comprises of combination of differently shaped hilt components, is based upon detailed study of several hundred swords from what is now Germany. The book made Continental corpus accessible and the careful and precise work led to conclusion that it is considered to be one of the most solid studies in the field. Geibig classified 19 combination types, dated to the period between 9th and 12th century. 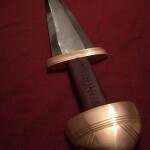 The combination type 7 describes the form of the hilt that is visually identical with the sword of Mr. Jones. 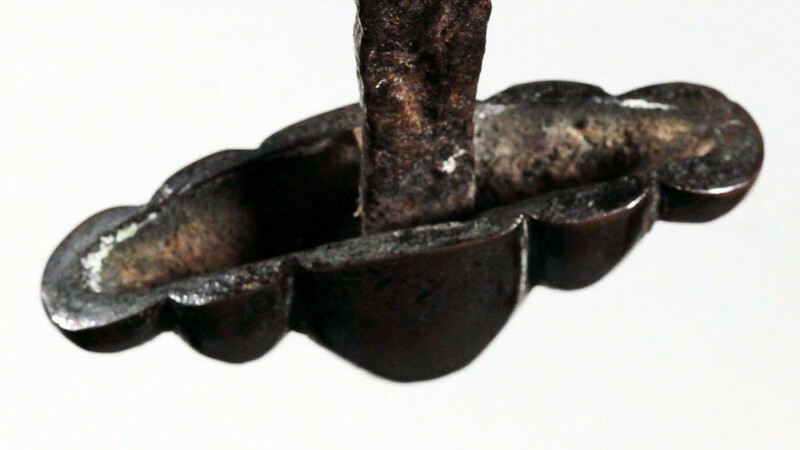 According to Geibig, the 5-lobed pommel rests at the pommel guard and both these components are attached by the exposed peened tang. According to Geibig, this combination type is equal to Petersen’s type L, even though there is a little different shape of the cross-guard: type L cross-guards are more pointed from the top view, while combination type 7 cross-guards are rounded. Geibig’s combination type 7, taken from Geibig 1991: 47, Abb. 8. 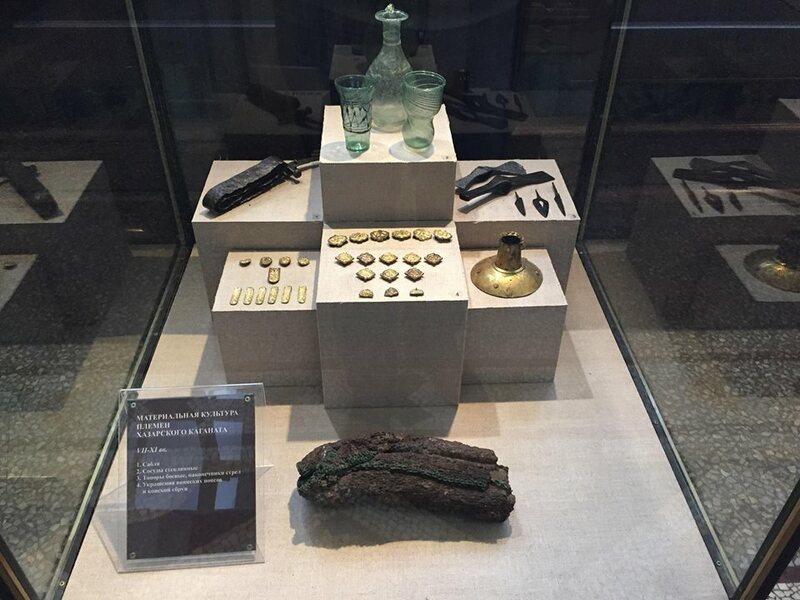 Therefore, we should follow this advise and have a look what the British archeological material has to offer. To our surprise, the material is quite impressive and offers good analogies, but it is poorly described as a whole. 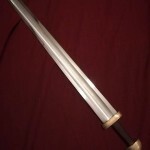 We will try to mention the swords that have curved guards and 5-lobed pommels. A closer attention will be given to cast elements. To contradict the Mr. Aksdal’s argumentation, we have to state there already are swords with cast components and 5-lobed pommels in his own article, classified as Petersen’s type L swords. 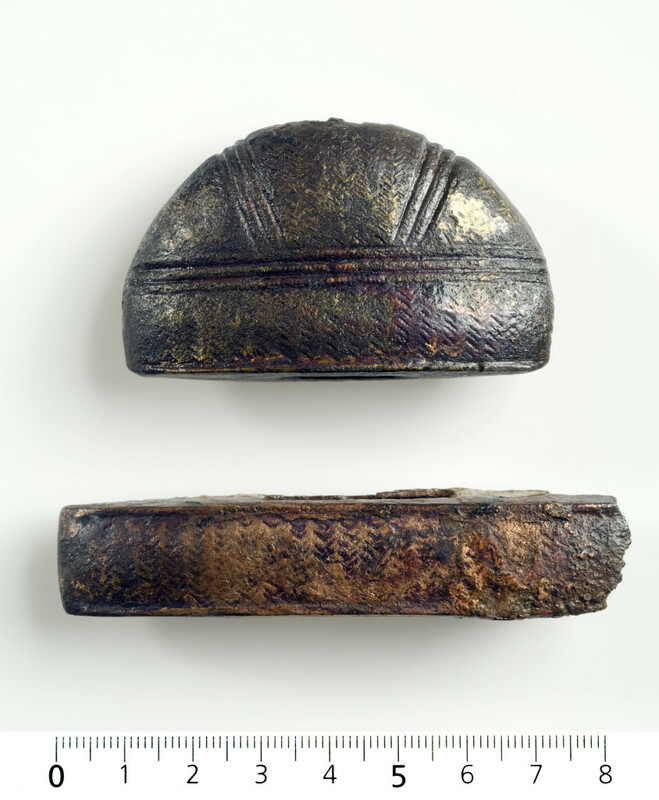 In the museum of Norwich, a decorated 5-lobed sword pommel cast in bronze is stored (Bjørn – Shetelig 1940: 61; Davidson 1962: 55-56). 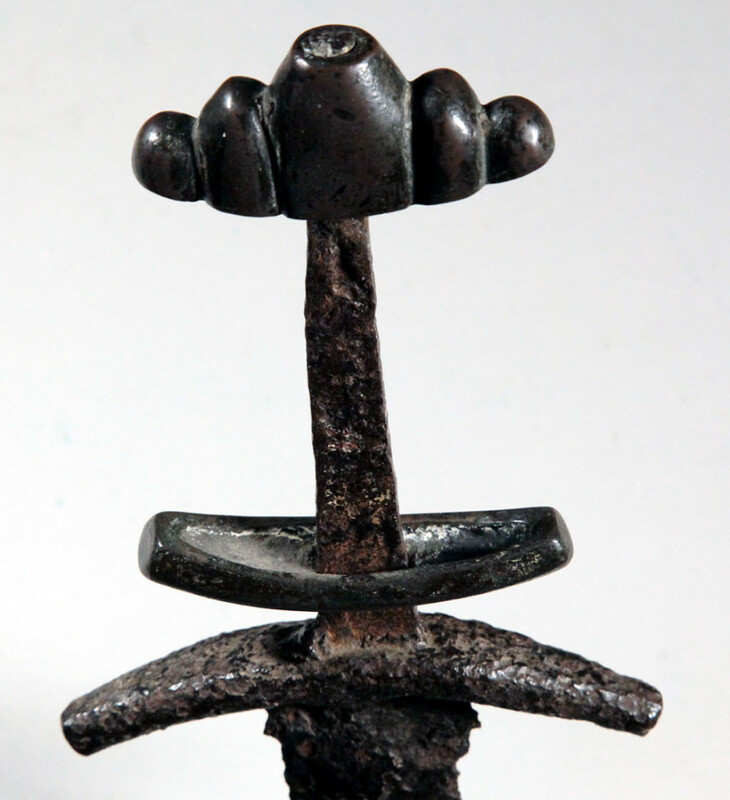 The pommel is classified as a part of a Petersen’s type L sword (Aksdal 2017: 87, Catalogue B:26). 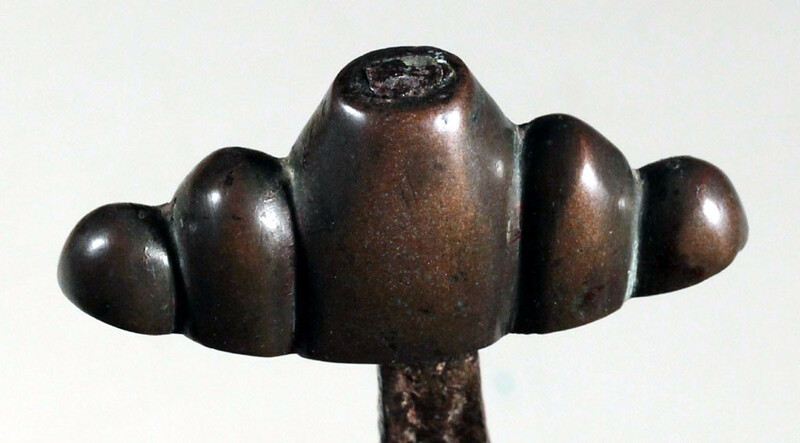 The second example is the sword from Surrey (1996.0604.1; British museum 2018), which has 5-lobed pommel and guards cast in bronze. Again, the sword is categorized as Petersen’s type L by Mr. Askdal (2017: 87, Catalogue B:34). To be fair, these pommels are rather asymetrical and their lobes are more pointed, compared to the sword of Mr. Jones. To sum up, the sword from Surrey still represents one of the closest analogies. 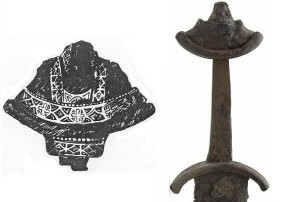 The pommel from Norwich (left) and the sword from Surrey (right). Taken from Davidson 1962: Fig. 41a and British museum 2018. The distribution of type L swords in Great Britain. Distribution of loose cast pommel from 9th-12th century in Britain. Click the map for an interactive Google Map. 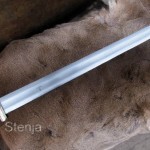 As we can see, cast pommels were used for various typologically and chronologically different hilts, and therefore we can speak of a kind of tradition. 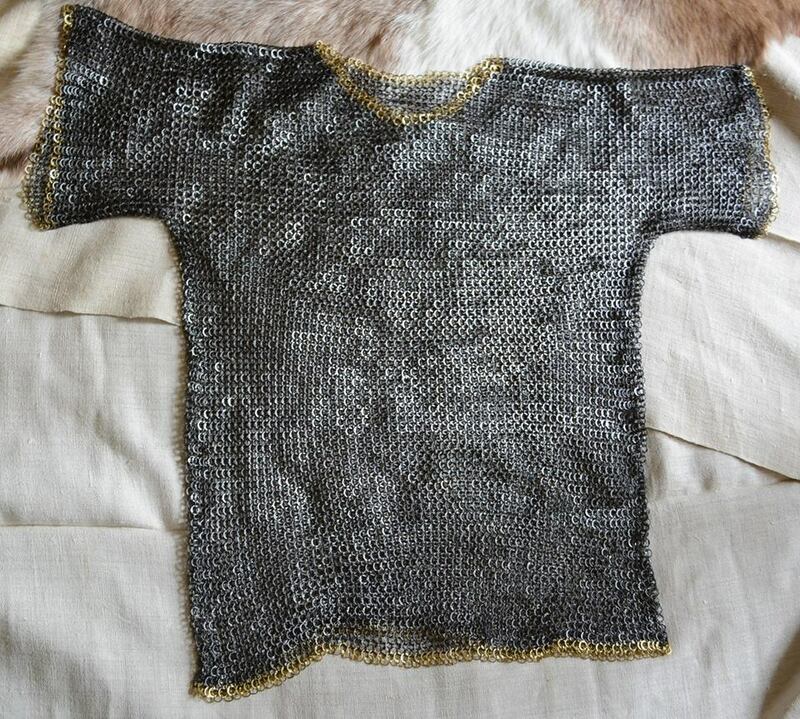 The tradition is more obvious when we realize that cast pommels occur in the period from the earliest phase of Anglo-Saxon period to at least High Medieval. 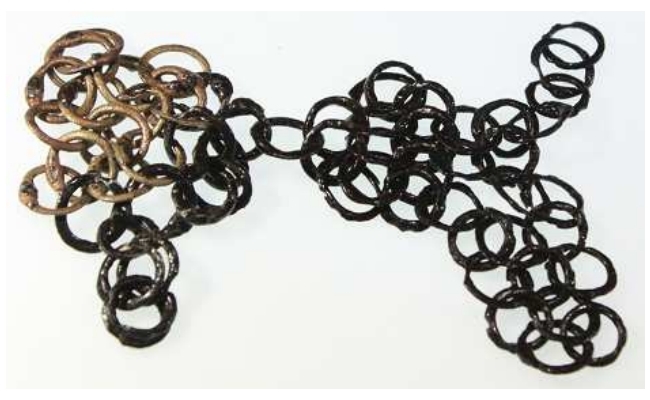 80 pieces are made of copper alloy, 1 piece is cast in lead. The pommels depicted on our map are loose, found separated from the sword or just with a fragment of tang, which is also striking. According to Anglo-Saxon living history expert Paul Mortimer, such a big number is not coincidence and the pommels could be violently torn off during a ritual destruction, for example. We can also notice that lobed curved pommels attached to upper guards with exposed peened tang represent a majority of the loose pommel. On the map, there are 52 finds that are mostly concentrated in East and West Midlands, East of England, Yorkshire and the Humber and South East England regions. This distribution corresponds to the distribution of Petersen’s type L swords quite well. There are at least two more pommels of this form in the private collection of Mr. Justin Mercier. This kind of popularity can mirror the fact that hollow upper guards and pommels peened to the tang could be done more easily than other types of constructions. It is surprising there are such an huge amount of sword pommels that are not described in the literature. 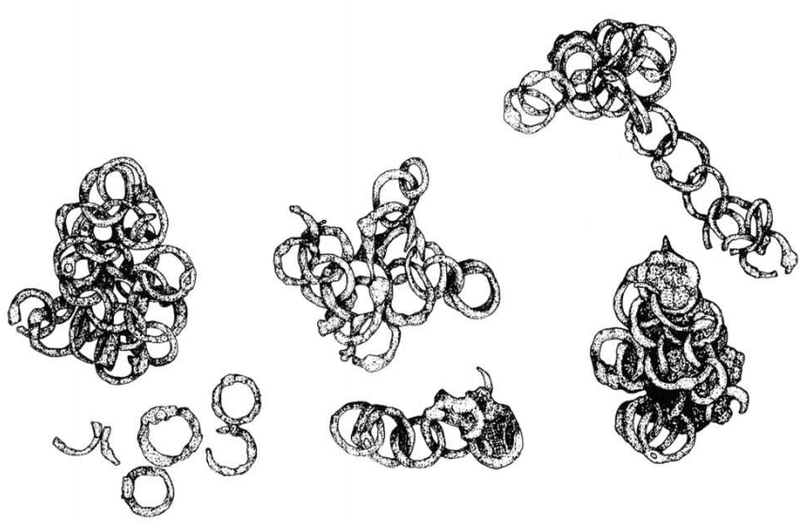 On the website of Portable Antiquities Scheme, the pommels of this type are described as croissant-shaped pommels, Petersen’s type L pommels or Wheeler’s type VI by contributing editors. The regular lengths of type 2.1.1. pommels are 44.8-65 mm, while the maximum height reaches from 20.6 to 32.2 mm. The pommels have thicknesses of 14-23.7 mm; the thickness of the casing is 2-4.4 mm. The weight is around 27.4-77.55 g (some heavier pieces include fragments of tangs). The pommel of the Mr. Jones’s sword is slightly longer, but other dimensions do match precisely. 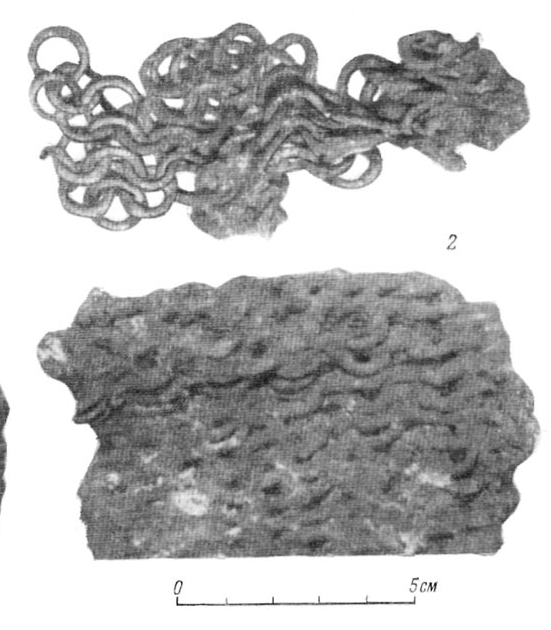 Loose cast pommels of the type 2.1.1. The source of the pictures: PAS. 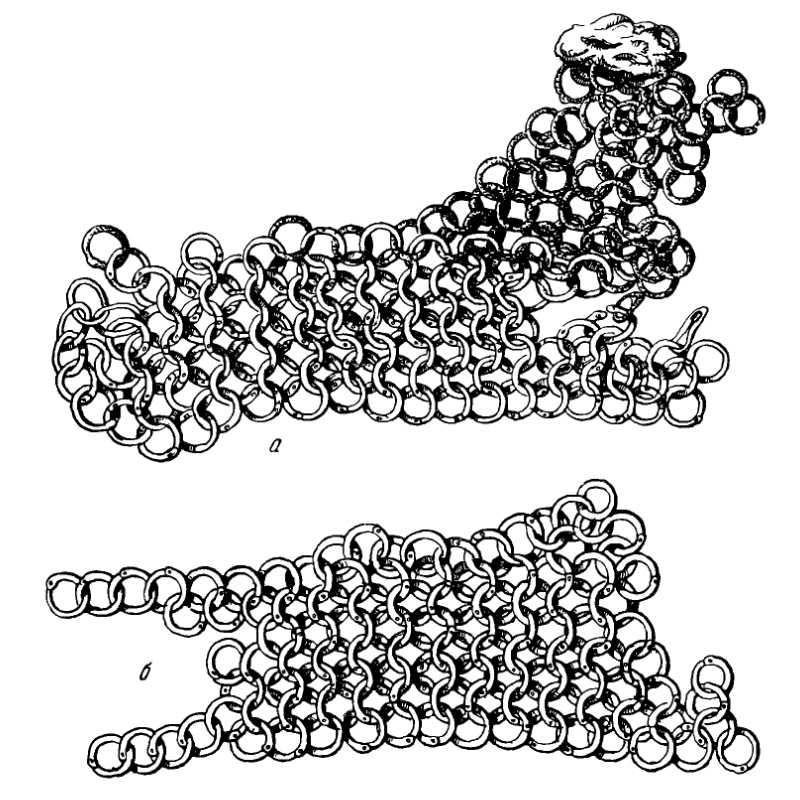 Distribution of loose cast guards from 9th-12th century in Britain. Again, copper alloy components are distributed across the same regions. Regarding the cross-guards, every piece is unique. 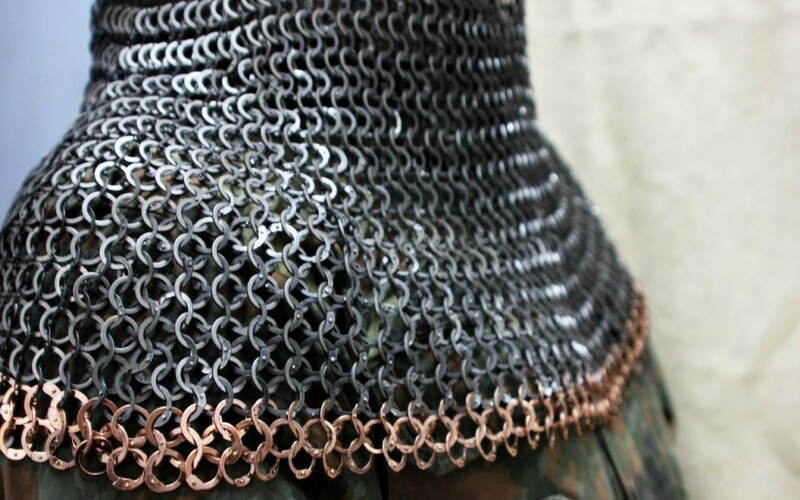 The number of cross-guards is lower that the number of upper guards, which may suggests that the cast cross-guards could have been used less often. That could correspond with the fact that the sword of Mr. Jones combines an iron guard and a cast upper guard and pommel. The upper guards are divided to two categories. The category 2.1. is the most interesting for us, as the upper guard of the examined sword falls into this group. The most of guards in this category were dated to Late Middle Ages by the PAS website, but we believe this is incorrect. 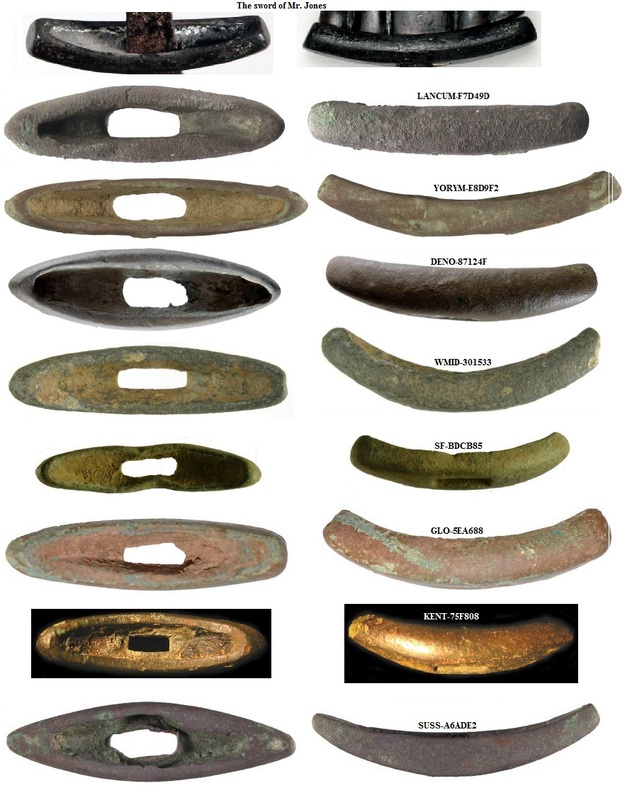 Not only two finds are dated to Early Medieval period, but they closely resembles the type L upper guards in shapes, proportions and sizes (see for example Aksdal 2017: Tab. 1-2). In this group, we can find curved and mostly hollow guards with a small rectangular hole for the tang. They are 56.78-87.7 mm long, 6.54-21.05 mm high and 12.77-22 mm thick. The guard of Mr. Jones’s sword fits in these categories. However, there are also some difference: the ends of guards are not flattened and there is no evidence of the central raised ridge line. The upper guard of Mr. Jones’s sword is 74 mm long, while the pommel is 65.6 mm long, so the difference in lengths is 8.4 mm. We have already told that the length of loose pommels varies between 44.8-65 mm. In proportion to loose upper guards, the difference is 11.98-16.54 mm. The thicknesses of loose components are comparable (14-23.7 mm : 12.77-22 mm). The future examination can reveal whether the loose pommels and loose upper guards do fit or not. Loose cast upper guards. The source of the pictures: PAS. For the next part of the analysis, we have to ask whether there is any complete sword that applies curved guards and peened cast 5-lobed pommel. In 1967, Vera Evison published an interesting study about an unmapped type of Anglo-Saxon swords that stand close to Petersen’s type L and Z (Evison 1967). The main feature that differentiates this type from Petersen’s is a differently shaped guard. Mrs. Evison called the examined group Wallingford Bridge sword type and suggested they were made in souther England in 10th-11th century. 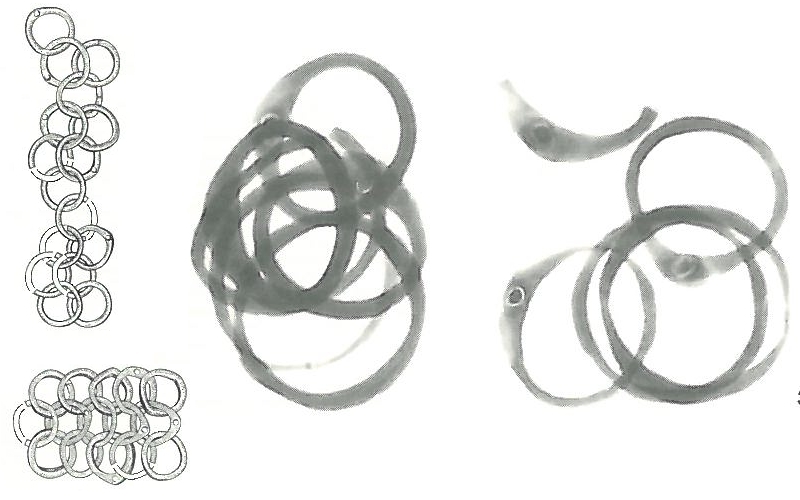 Even though there are only 9 examples in England (7 of which were found in the River Thames) and they rather resemble Petersen’s type Z / Wheeler’s type VI when it comes to the construction, we believe the study is an important step forward to show the complexity of local and transitional variants. If the concept is correct, then the sword of Mr. Jones and the pommels of the type 2.1.1. stand between Petersen’s types L, S and Z, not only by the form, but also by the chronology, just as Wallingford Bridge type does. Generally speaking, type L is the closest and it should be legit to call Mr. Jones’s sword type L variant until a more precise typology is invented. 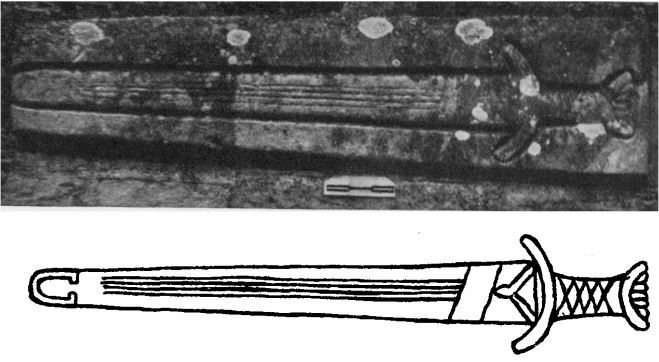 Wallingford Bridge type swords (Evison 1967: 162, Fig. 1). In the Evison’s article, we can find a reference to the sword from Mileham, which seems to be a second close analogy to our sword (Evison 1967: 185, Fig. 3b, 6a). This sword has copper alloy hilt components, including a richly decorated guard and an one-pieced pommel of our type 3.2. To our knowledge, there are no closer published paralels of Mr. Jones’s sword than swords from Surrey and Mileham. Therefore, the sword of Mr. Jones can be called unique in that regard. 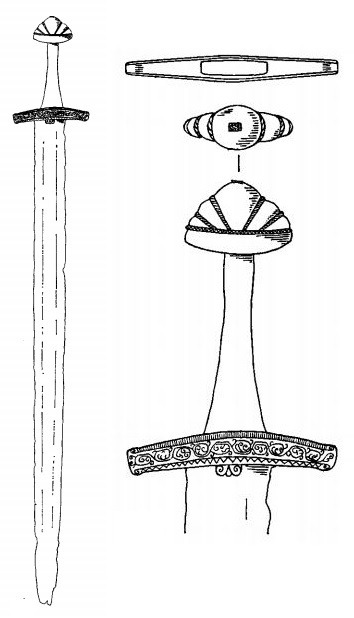 The sword from Mileham (Evison 1967: Fig. 3b, 6a). 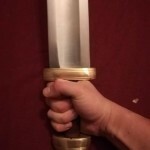 In 2012, a discussion about loose cast 5-lobed pommel arised on MyArmoury.com. 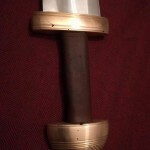 Shane Allee, a member of the forum, posted a picture of the sword, that was sold on Ebay more than 15 years ago. The sword seems to belong to the same type as Mr. Jones’s sword. However, we do not have any particularised information about the sword. The sword sold on Ebay. In the first part of this article, we tried to describe an unusual sword from a private collection. The uniqueness of such a sword led us to a type that stood aside completely unnoticed. 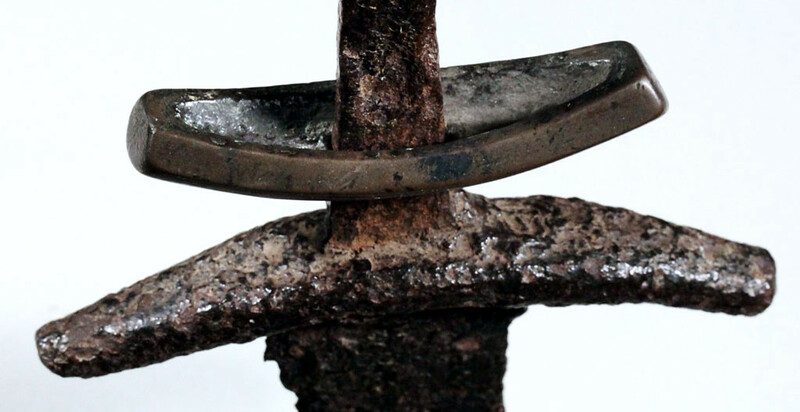 The closest analogies were found in 10th-11th century Britain, a country where the mixture of styles created a variety of transitional swords that apply different contructions, shapes and materials altogether. Nevetherless, it will require a brilliant mind and a huge time reserve to arrange the swords in a realistic way. I hope you liked reading this article. If you have any question or remark, please contact me or leave a comment below. If you want to learn more and support my work, please, fund my project on Patreon. Stone carving from Eberston, Britain. Taken from Grove 1938: 256, Fig. 5. Aksdal 2017 = Aksdal, Jostein (2017). Dei anglosaksiske sverda : L-typesverd i England og Skandinavia. In: VIKING – Norsk Arkeologisk Årbok, Vol: LXXX, 59–88. Bjørn – Shetelig 1940 = Bjørn, Anathon – Shetelig, Haakon (1940). 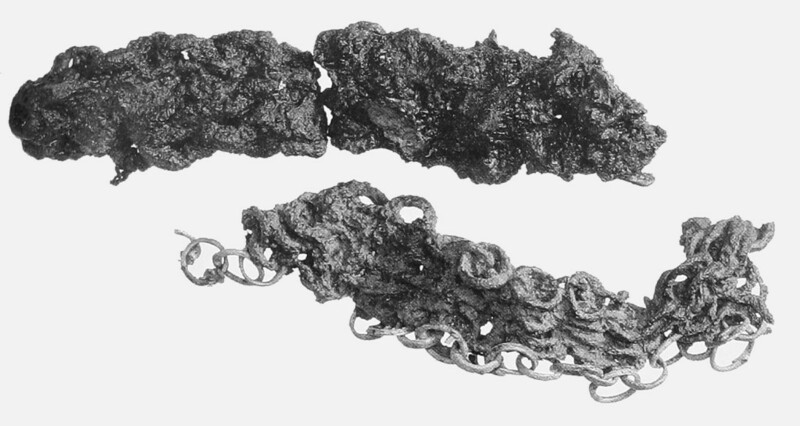 Viking Antiquities in Great Britain and Ireland, Part 4 : Viking Antiquities in England, Bergen. 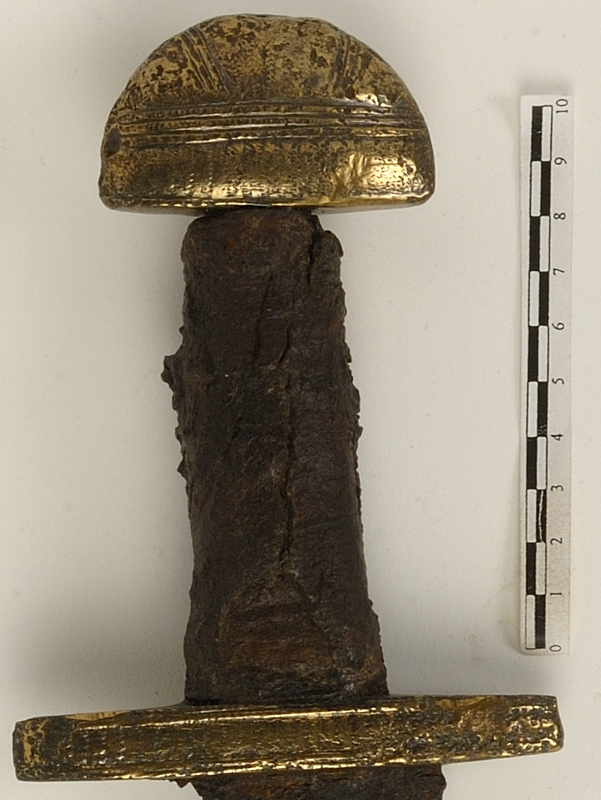 British museum 2018 = Sword from Surrey, Shepperton, Museum number 1996,0604.1. 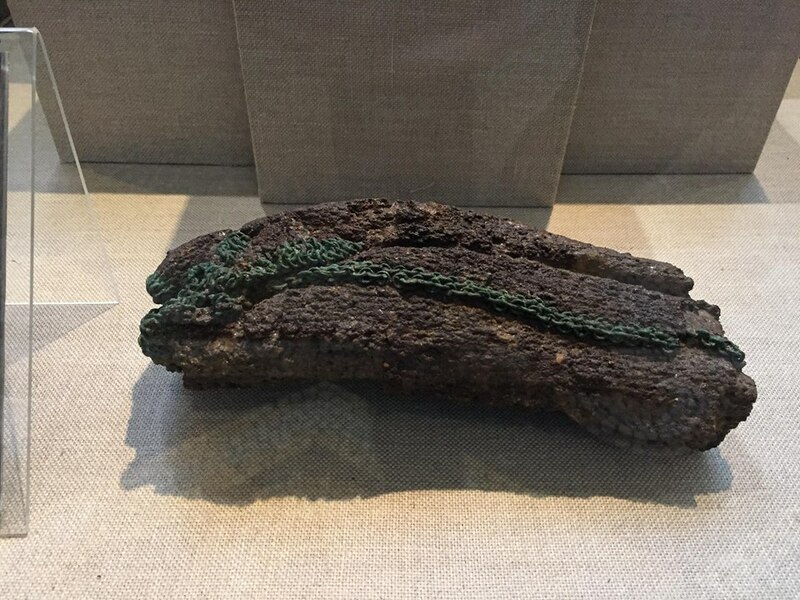 Electronic source, http:// www.britishmuseum.org/research/collection_online/collection_object_details.aspx?objectId=84 887&partId=1&searchText=1996,0604.1&page=1, visited 31th October 2018. Evison 1967 = Evison, Vera I. (1967). A Sword From the Thames at Wallingford Bridge. In: The Archaeological Journal 124(1): 160–189. Davidson 1962 = Davidson, Hilda R. Ellis (1962). 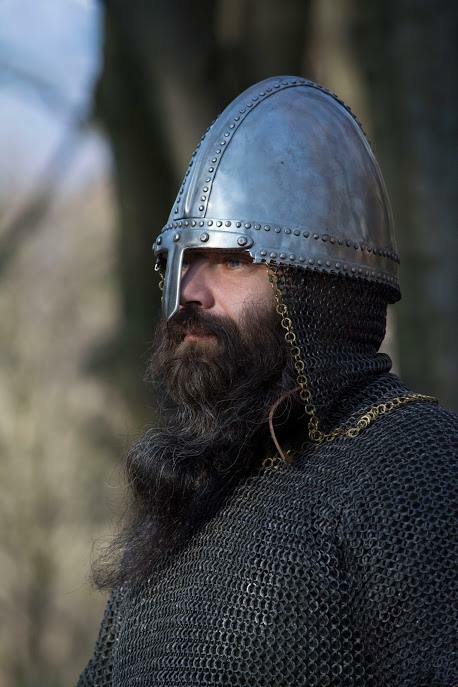 The Sword in Anglo-Saxon England. Its Archaeology and Literature, Oxford. Geibig 1991 = Geibig, Alfred (1991). Beiträge zur morphologischen Entwicklung des Schwertes im Mittelalter : eine Analyse des Fundmaterials vom ausgehenden 8. bis zum 12. Jahrhundert aus Sammlungen der Bundesrepublik Deutschland, Neumünster. Grove 1938 = Grove, L. R. A. (1938). 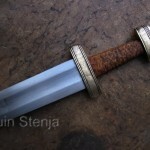 Five Viking-Period Swords. In: The Antiquaries Journal, 18(03): 251–257. Jakobsson 1992 = Jakobsson, Mikael (1992). Krigarideologi och vikingatida svärdstypologi, Stockholm : Stockholms Universitet. Jones 2002 = Jones, Lee A. (2002). Overview of Hilt & Blade Classifications. In: Oakeshott E. – Peirce, I. G. (eds). 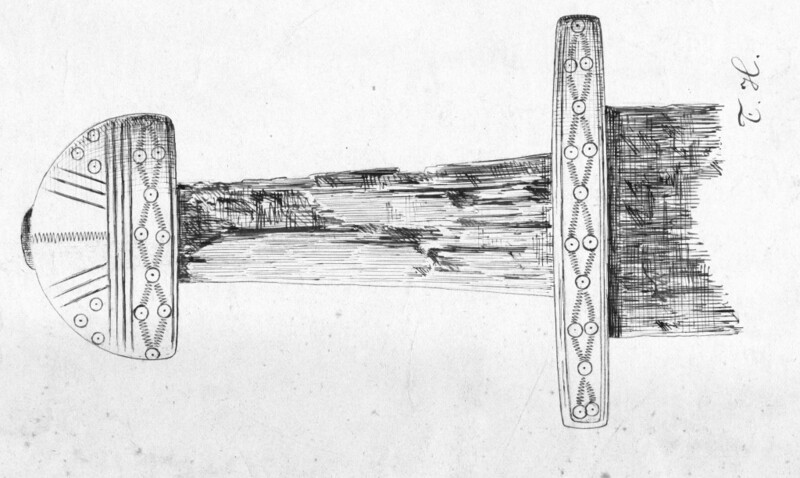 Swords of the Viking Age, Woodbridge: 15–24. Petersen 1919 = Petersen, Jan (1919). De Norske Vikingesverd: En Typologisk-Kronologisk Studie Over Vikingetidens Vaaben. Kristiania. Wheeler 1927 = Wheeler, R.E.M. (1927) London and the Vikings. London Museum Catalogues: No 1, London. V posledních letech svého bádání jsem náhodně narazil na několik raně středověkých fragmentů kroužkových zbrojí, jejichž okrajové kroužky byly vyrobeny z neželezných kovů. Téma kroužkových zbrojí má mezi reenactory řadu fanoušků, a proto mne překvapilo, že jsem nebyl schopen dohledat žádnou ucelenou práci, jež by zpracovávala bronzové a zlaté lemy kroužkových úpletů. Z tohoto důvodu vznikla tato práce, která si klade za cíl shromáždit co nejvíce materiálu a otevřít novou problematiku. Zároveň chci poukázat na kvalitní repliky, které doposud vznikly. Nejstarší lemy z bronzových kroužků, které jsou mi známé, představují římské fragmenty z 1. století našeho letopočtu (Russell Robinson 1975: 171–173). Ozdobné lemy, v jednom nebo více pruzích, jsou dobře známy také z dochovaných středověkých brní, kde obvykle zdobí límeček, rukávy či spodní okraj zbroje (Tweedle 1992: 1003). Méně obvyklou úpravou jsou vzory, například kříže, umístěné doprostřed kroužkového úpletu, kde působí kontrastně (Vike 2000). Zbroje, které jsou uložené v evropských sbírkách, nás opravňují tvrdit, že tyto formy dekorací byly poměrně populární ještě v 15.–17. století (Arcichovskij 1949: 174). Při hledání analogií mimo Evropu bychom mohli najít řadu podobných kusů v arabském či indickém prostoru, kde se tyto prvky uplatňovaly až do novověku. Raný středověk, který stojí na přelomu mezi antikou a středověkem, byl dosud v tomto ohledu přehlížené období a nálezy byly zpravidla publikovány samostatně, bez analogií. Kompletní brně z tohoto období jsou spíše vzácné. Častěji nacházíme samostatné kroužky či fragmenty úpletů, které čítají několik jednotek až desítek kroužků. Takové fragmenty jsou obvykle interpretovány tak, že ač mohly původně pocházet z kroužkových zbrojí, byly následně využity jako ochranné amulety či talismany (Tweedle 1992: 1003). Ochranné předměty přitom mohly mít v době uložení statut starožitnosti – například lamely, které byly uloženy v dětském hrobě z Prušánek (velkomoravské období), se datují do 2. století a mohly být získány v římské pevnosti u Mušova (Bernart 2013: 93). V 8. sálu Státního historického muzea (GIM) v Moskvě je uložena srolovaná kroužková zbroj, která je vystavena spolu s předměty řazené ke kultuře Chazarského kaganátu v 7.–11. století. Podle Sergeje Kainova, pracovníka muzea, je původ zbroje neznámý, ale nejpravděpodobněji pochází z Přikubání. Na spodním okraji zbroje si můžeme povšimnou tří řad „mosazných“ kroužků, které zřejmě také kopírují rozparek. Vnější průměr kroužků této zbroje činí 7 mm. Za informace o zbroji, kterou jsem měl možnost vidět na vlastní oči, jsem vděčný Sergeji Kainovovi. Jako další si uvedeme velký fragment pletiva, který nalezl V. I. Sizov roku 1885 ve velké mohyle (č. 20) v Gnězdovu (Kirpičnikov 1971: kat. č. 8). Mohyla je datována do 10. století. Úplet obsahuje kroužky s průměrem 13 mm a tloušťkou drátu 1–1.5 mm. „Měděné“ kroužky, které jsou svařené, u tohoto fragmentu tvoří 6 řad. Fragment kroužkového úpletu z Gnězdova (č.20). Zdroj: Kirpičnikov 1971: Tabl. I: 3. V Gnězdovu byl objeven ještě jeden exemplář, a sice v mohyle č. 86 (18), kterou odkryl S. I. Sergeev roku 1901 (Kirpičnikov 1971: kat. č. 12; Sizov 1902: 97–100). Tato mohyla je datována do druhé čtvrtiny 10. století. Mohyla mimo jiné obsahovala meč, dlouhý nůž, kopí, kroužkovou košili a přilbici s kroužkovým závěsem. Zbroj, která byla složená, byla vyrobena z kroužků dosahujících vnitřního průměru 6–8 mm při tloušťce drátu 1,5 mm, zatímco závěs přilby byl vyroben z menších kroužků (4 mm vnitřní průměr při tloušťce drátu 1 mm). Podle Kirpičnikovova lze v kroužkovém úpletu nalézt „lem z měděných kroužků“, ač nespecifikuje, zda se lem nacházel u zbroje či u závěsu. Nutno podotknout, že Sizov neželezné kroužky z mohyly č. 86 (18) ve svých pracích nezmiňuje. Fragmenty kroužkového pletiva z gnězdovské mohyly č. 86 (18). Zdroj: Kirpičnikov 1971: Tabl. I: 2. Čtvrtý příklad byl nalezen v letech 1872–3 D. Samokvasovem ve slavné „Černé mohyle“ u Černihova (Kirpičnikov 1971: kat. č. 17; Samokvasov 1908: 197–201; Samokvasov 1916: 10). Tato mohyla se datuje do 60. let 10. století. Podle Samokvasova byly v mohyle kromě mečů, přileb a picích rohů nalezeny také fragmenty dvou kroužkových zbrojí, přičemž u fragmentů druhé zbroje „jsou patrné měděné kroužky“ (Samokvasov 1908: 198). Fragmenty obsahující měděné kroužky (kat. č. 3265) se skládají jen z několika málo řad a jsou zpečené dohromady. Fragmenty kroužkové zbroje s měděnými kroužky, kač. č. 3265. Pátý a poslední východoevropský nález pochází z Novgorodu (Arcichovskij 1949: 174, Ris. 13a–b; Kirpičnikov 1971: 13, kat. č. 26). Sestává ze dvou kusů, které byly nalezeny ve vrstvě datované do konce 11. či začátku 12. století. 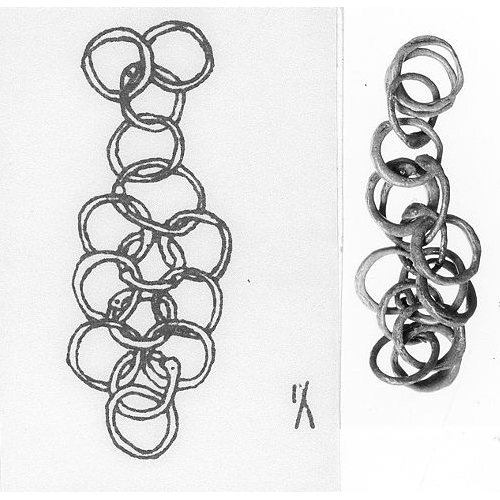 Jeden z kusů má rozměry 18 × 5 × 8 cm. Všechny kroužky jsou nýtované a mají průměr 10 mm. Menší část kroužků je železná, zbytek tvoří „měděné“ kroužky, které jsou uspořádány do lemu o šířce 4 řady. Fragmenty kroužků z Novgorodu. Zdroj: Arcichovskij 1949: 175, Ris. 13a–b. Součástí svatovítského pokladu střeženého v Praze je kromě jiného přilbice a kroužková zbroj. Nedávné výzkumy prokázaly, že nejstarší části těchto artefaktů pocházejí z 10. století (Bernart – Bravermanová – Ledvina 2014). Ke kroužkové zbroji přináleží tzv. pláštík, obdélníkový pruh pletiva, jehož horní část – „stojací límec“ o rozměru 50×7,5 cm – je lemována třemi řadami zlatých kroužků (Schránil 1934). Na samotném vrcholu límce se nachází jedna řada železných kroužků, která navazuje na zlaté kroužky. Detailní rozbor potvrdil, že límec je složen ze stejných kroužků jako brň, ale odlišuje se od zbytku pláštíku. Badatelé (Bernart – Bravermanová – Ledvina 2014: 180–181) předpokládají, že límec mohl být ze všeho nejdříve stojacím límcem u kroužkové zbroje, ze které byl posléze, snad kolem roku 1000, sňat a byl využit jako závěs na přilbici, kde byl uchycen řadou železných kroužků, které navazují na zlaté lemování. V době, kdy byl z přilby odebrán držák závěsu (tvořený přehnutým stříbrným plíškem), se stala barmice nefunkční a našla uplatnění jako základ pláštíku, ke kterému byla dopletena větší část do podoby, kterou vidíme dnes. Prakticky identické složení má i křížový úplet lemovaný zlatými kroužky, který je v současné době součástí praporu sv. Jiří. Podle badatelů se tento kroužkový křížek původně nacházel na praporci sv. Václava, a náleží do nejstarší vrstvy pokladu (Bernart 2010: 68). Pláštík s „límcem“ odděleným zlatým lemem. Zdroj: Schránil 1934: Tab. XVII. Detail límce se zlatým lemováním. Zdroj: Bernart 2010: obr. 37. Úplet ve tvaru kříže na praporci sv. Jiří. Zdroj: Fototéka Pražského hradu, Jan Gloc. Největší soubor raně středověkého pletiva z území bývalého Československa pochází z Mikulčic. Bohužel řada fragmentů roku 2007 shořela v mikulčickém depozitáři spolu s dokumentací, a proto máme v současné době k dispozici pouze omezené množství. Jeden z fragmentů, nalezený ve vrstvách velkomoravského horizontu při výzkumu části sídliště severozápadně od pátého kostela, je složený z „bronzových“, zřejmě též pozlacených kroužků (Bernart 2010: 70–71; Kavánová 2003: 238–239). Fragment je drobný; na výšku má pouze čtyři řady. Fragment bronzových (pozlacených?) kroužků z Mikulčic. Zdroj: Kavánová 2003: 234, Obr. 40:9. Další zástupce byl nalezen na velkomoravském hradišti Bojná I, jehož zánikový horizont spadá do počátku 10. století (Bernart 2010: 73–74; Kouřil 2014: 330, Pieta 2015: 27, Obr. 15:5, Obr. 17:2). Na tomto hradišti bylo nalezeno několik kroužkových fragmentů, z nichž jeden je zdoben pěti řadami „mosazných“ či „bronzových“ kroužků. Všechny neželezné kroužky jsou nýtované a dosahují vnějšího průměru 9 mm. Podle současné interpretace byl tento fragment součástí závěsu přilby, která byla na hradišti objevena. Fragment s „bronzovými“ kroužky, Bojná I.
Zdroj: Pieta 2015: 31, Obr. 15:5. Zdroj: Bernart 2010: 73, obr. 44. Mezi nejlépe zdokumentované pletivo s neželeznými kroužky jednoznačně patří fragmenty nalezené v hrobu č. 14 z gotlandské lokality Slite (SHM 23248:14). Dva oddělené kousky, čítající dohromady 20×5 řad, mají lem z „měděných“ kroužků, které tvoří dvě boční řady (Thunmark-Nylén 1995: Abb. 261:7–8; Thunmark-Nylén 2000: 577; Tweedle 1992: 1185, Fig. 589l–m). Zdá se, že jednalo o vertikální lem, ne nepodobný okraji rukávu. Železné kroužky dosahují průměrů 8,5–9 mm, zatímco neželezné kroužky 8,15–8,76 mm. Vnější řada neželezných kroužků je nýtovaná a je vyrobena z oválného drátu, který má tloušťku 1,1 mm. Otvory pro nýtky jsou v neželezných kroužcích zhruba 1 mm široké, mírně oválné a kónické. Nýtky jsou železné. 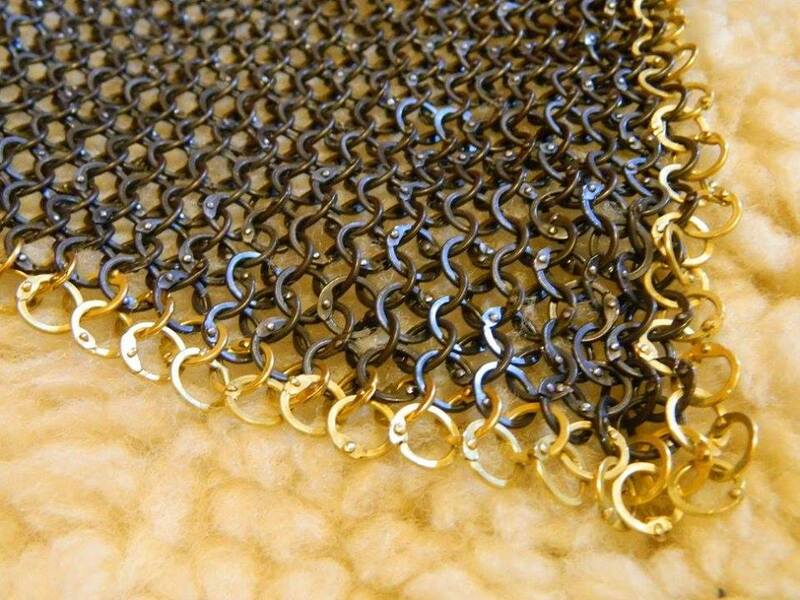 Druhá řada neželezných kroužků je solidní; kroužky mají průměr materiálu 1,7×1,2 mm. Na svých vnějších obvodech jsou neželezné kroužky opatřeny drážkou. Fotografie fragmentů ze Slite. Zdroj: Thunmark-Nylén 1995: Abb. 261:7–8. Rentgen fragmentů ze Slite. Zdroj: Tweedle 1992: Fig. 589l–m. Druhý a méně známý švédský nález pochází z tzv. Černé země v Birce (SHM 5208:30), kde byl objeven H. Stolpem v letech 1871–1873. Jedná se o fragment čítající 15 kroužků o průměru 7,5 mm. Z obrázků je patrné, že fragment sestává z 11×3 řad, přičemž středové kroužky jsou nýtované bronzovými nýtky, zatímco okrajové působí solidnějším dojmem a nenesou známky nýtů. Do dnešního dne nebyl tento fragment publikován. 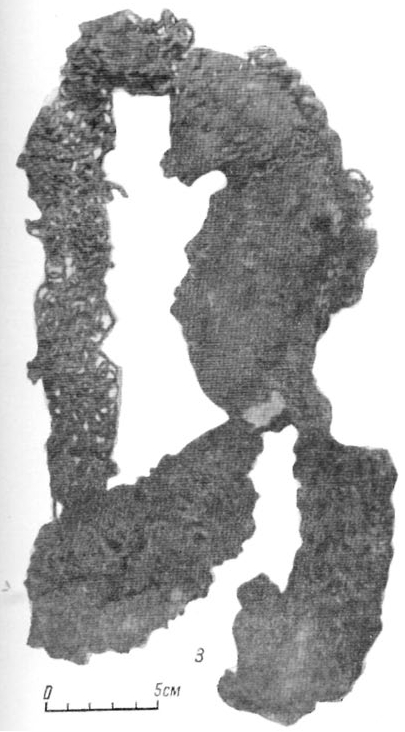 Fragment bronzových kroužků z Birky. Zdroj: katalog SHM. V pevnosti holštýnského Oldenburgu / Starigradu bylo nalezeno celkem 5 různých pletiv (Kempke 1991: 41–44, 77, Abb. 23–26). Tři z nich sestávají „bronzových“ kroužků. 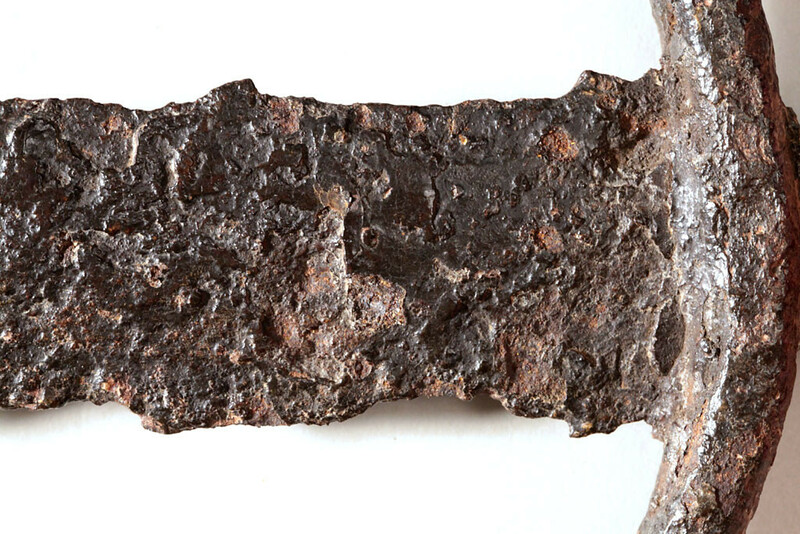 První fragment (kat. č. 149), datovaný do 9. století, se skládá z jedenácti kroužků uspořádaných do sedmi řad. Zřejmé je střídání řad nýtovaných kroužků a řad solidních kroužků. Kroužky mají průměr 8–9 mm při tloušťce drátu 1 mm a dohromady váží 3 gramy. Druhý fragment (kat. č. 150), datovaný do 11. či 12. století, sestává z devíti kroužků uspořádaných do tří řad. Všechny kroužky jsou nýtované, mají průměr 10–11 mm při tloušťce drátu 1 mm. Váha druhého fragmentu činí 4 gramy. Třetí pletivo (kat. č. 151), datované k roku 1000, se skládá ze dvou fragmentů – první čítá 16 kroužků uspořádaných do deseti řad, druhý obsahuje 15 kroužků uspořádaných do tří řad. Všechny kroužky jsou nýtované, mají průměr 6 mm při tloušťce drátu 1 mm. Některé kroužky jsou vyrobeny z drátu kruhového průřezu, jiné jsou vyrobené spíše z plochého drátu. Celková váha činí 6 gramů. 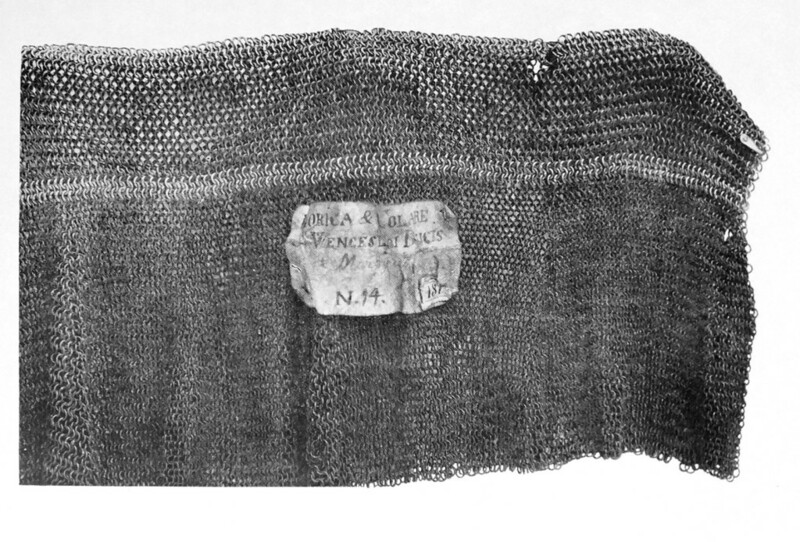 Fragment č. 149, Oldenburg / Starigrad. Zdroj: Kempke 1991: Abb. 23:4, 26:1. Fragment č. 150, Oldenburg / Starigrad. Zdroj: Kempke 1991: Abb. 23:3, 26:2. Fragment č. 151, Oldenburg / Starigrad. Zdroj: Kempke 1991: Abb. 23:1–2, 26:3. Roku 1980 byl v lokalitě Fenékpuszta nalezen avarský hrob (1980/2) z 6.–7. století, ve které byly nalezeny zoxidované „bronzové“ kroužky (Straub 1999: 182, 2. kép 5, 3. kép 5). Umístěny byly na levé části pánevní kosti pod úrovní opaskové přezky. Pletivo tvoří 5 fragmentů propojených kroužků a 6 fragmentů samostatných kroužků. Jedná se o kombinované pletivo složené z nýtovaných a solidních kroužků, průměr kroužků je 12 mm. Počet řad není možné stanovit, ale zdá se, že nejdelší fragment čítá kolem 8 řad. Fragmenty pletiva z maďarské Fénekpuszty. Zdroj: Straub 1999: 182, 2. kép 5. Fragmenty pletiva z maďarské Fénekpuszty. Zdroj: Straub 1999: 182, 3. kép 5. Při vykopávkách v městské části Coppergate v Yorku byla roku 1982 nalezená tzv. přilba z Coppergate (Tweedle 1992: 851), vůbec nejzachovalejší anglosaská přilba. Je datovaná do 8. století. Je vybavena kroužkovým závěsem, který v současném stavu čítá 1947 kroužků uspořádaných do 28×81 řad (Tweedle 1992: 999). Řady nýtovaných a solidních kroužků se střídají. Kroužky mají vnější průměr ca. 8 mm při tloušťce drátu ca. 1 mm. Závěs byl uchycený do držáku (tvořeného přehnutým mosazným plíškem) pomocí řady zavíraných kroužků ze slitiny mědi, které byly průměrně větší (8–8,5 mm) a masivnější (1,2–1,4 mm) než kroužky na zbytku pletiva. Další tři neželezné kroužky byly nalezeny na spodním okraji závěsu, kde přečnívají linii železných kroužků – je tedy možné, že závěs byl dříve opatřen nejen vrchním, ale též spodním lemem, či tento nebyl nikdy dokončen. Detail držáku barmice s kroužky ze slitiny mědi, přilba z Coppergate. Zdroj: Tweedle 1992: 994, Fig. 454. Kroužkový závěs přilby z Coppergate. 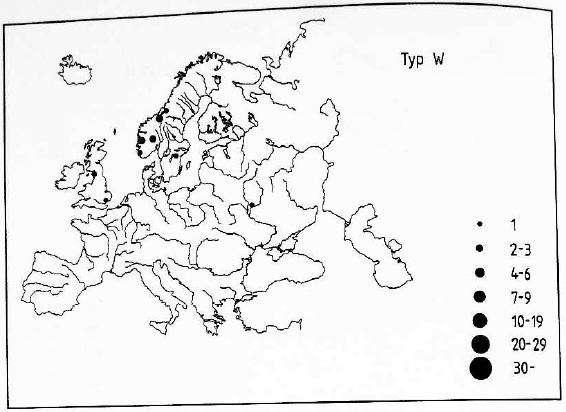 Zdroj: Tweedle 1992: 934, Fig. 402. Detail neželezných kroužků na spodním okraji závěsu, přilba z Coppergate. Zdroj: Tweedle 1992: 1010, Fig. 469. V katalogu jsme byli schopni shromáždit celkem 15 různých evropských pletiv z období 6.–12. století, která jsou zhotovena z neželezného kovu. 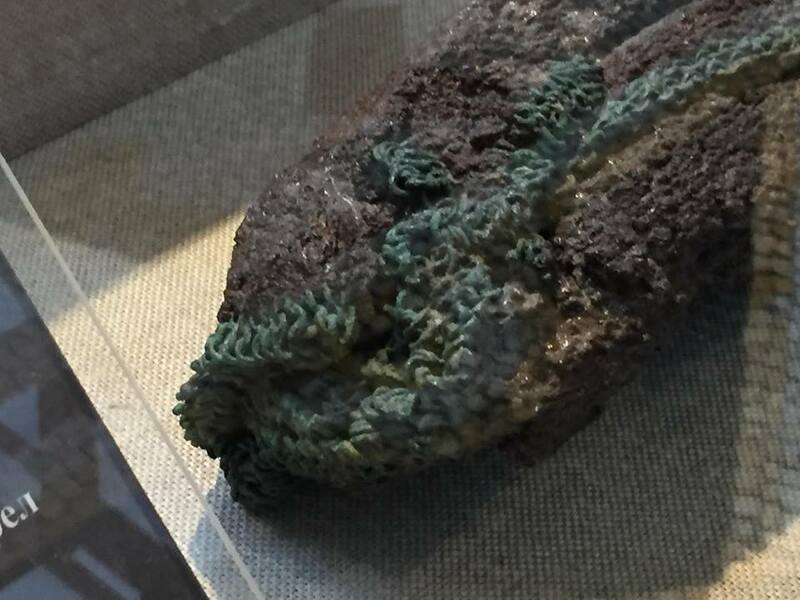 Materiálem je často slitina mědi (proto označení měď, mosaz, bronz), vzácněji zlato. Lze předpokládat, že slitina mědi nejvíce odpovídá naší definici mosazi. Ať již u víceméně kompletních úpletů nebo u fragmentů, neželezné kroužky tvoří 1–10 řad, které mohly sloužit jako ozdobné lemy či pruhy u límců, rukávů a spodních okrajů kroužkových zbrojí, závěsů u přileb či praporců. Podobná tendence se nachází také mimo Evropu, jak můžeme vidět u kroužkového pletiva z altajského nálezu Balyk-Sook (8.–9. století), kde je závěs přilby zdoben několika pruhy „bronzových“ kroužků (viz Kubarev 1997). 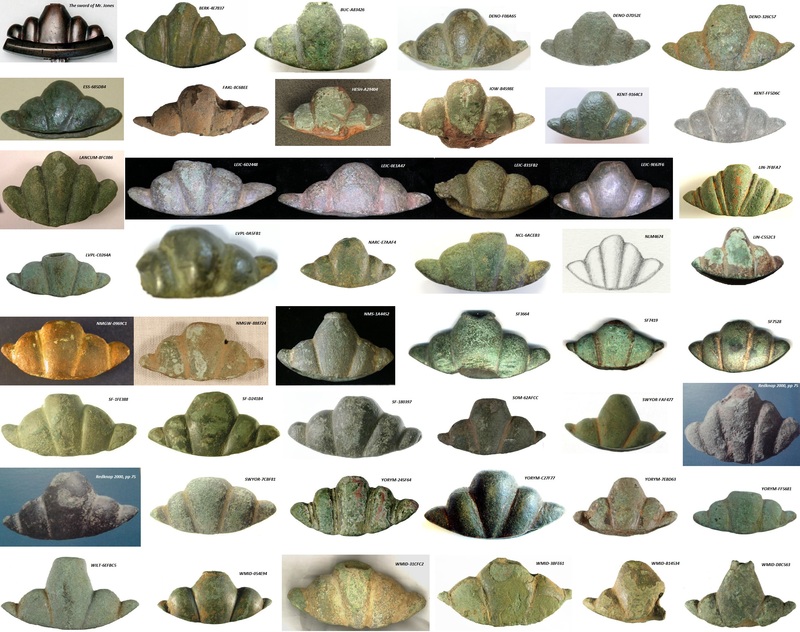 Nadto z anglického Sutton Hoo známe nálezy železných kroužků, které byly snýtovány „měděnými“ nýtky (Evans 1994: 41). Fragmentární povaha svědčí o častém využití těchto kusů pletiv k symbolickým a ochranným účelům. Řídké doklady o používání kroužků z různých materiálů lze nalézt také v ikonografii (NAL 1390, 7v) či písemných pramenech: „Někteří zhotovují ochranu hrudi, zejména brně ze železa a zlata“ (Dudo: Tři knihy o způsobech a činech prvních normanských vévodů II:2, ed. Lair 1865: 142). Kroužková zbroj a závěs s oranžovými kontrastními lemy. Zdroj: Obrazy z života svatého Albína z Angers (NAL 1390), 7v, 1050–1150. Kroužkové brnění v raném středověku představovalo velmi nákladnou součást výzbroje, jejíž nákladnost vycházela z neobyčejné pracné výroby, která vyžadovala zhotovení kroužků z drátu o síle 0,7–1,5 mm, obdélného nebo okrouhlého průřezu, jejich děrování, nýtování, svařování a ražení z plechu. Pro zhotovení jedné košile bylo zapotřebí 20 až 55 tisíc kroužků a zhruba 1000 pracovních hodin, a tímto způsobem zhotovená zbroj, chránící trup po lokte a stehna, nebyla těžší 10 kg (Kirpičnikov 1971: 13; Kola – Wilke 2000: 63; Pleiner 2002: 78). Experimenty ukázaly, je možné vyrobit plnohodnotnou kroužkovou košili o váze 4,5 kg při obvodu 140 cm a délce 95 cm. Důležitým závěrem této práce je poukázání na množství dochovaných brní, mezi kterými – na rozdíl od obecného přesvědčení – evidentně byly kvalitativní rozdíly, které spočívaly ve výrobě na míru, použitém materiálu, hustotě, absorpční schopnosti a dodatečných úpravách, které umocňovaly velkolepý vzhled. Dovolím si menší analogii ze současnosti: cena sériově vyráběné, funkční neprůstřelné vesty začíná kolem 10 tisíc korun, zatímco nejdražší zakázková vesta, kterou jsem byl schopen dohledat, je zdobena černými diamanty a stojí 65 milionů korun. Ve světle tohoto uvažování považuji ozdobné lemy z neželezných kroužků za známku kroužkové zbroje vyšší kvality. Názorným příkladem může být svatováclavská zbroj, která nejenže mohla disponovat límečkem zdobeným zlatem, ale její kroužky patří mezi ty nejdrobnější (vnější průměr 6–7 mm při tloušťce drátu 0,8–1 mm). Fragmenty z Gnězdova či Černé mohyly byly nalezeny v kontextech královsky vybavených hrobů, které vynikají i při srovnání s jinými mohylami. Přilba s lemovaným kroužkovým závěsem. Výroba: Peter Kocúr. Lemovaný kroužkový závěs. Výroba: Peter Kocúr. Lemovaná kroužková košile. Váha: 4,5 kg. Výroba: Peter Kocúr. Lemovaný kroužkový závěs. Výroba: Sergej Simunin, Kvetun. Přilba s lemovaným kroužkovým závěsem. Výroba: Sergej Simunin, Kvetun. Přilba s pruhovaným kroužkovým závěsem podle nálezu z Balyk-Sook. Dudone Sancti Quintini : De moribus et actis primorum Normanniæ ducum, ed. Jules Lair, Caen 1865. Arcichovskij 1949 = Арциховский А. В. (1949). Раскопки восточной части дворища в Новгороде // Материалы и исследования по археологии СССР. № 11. М.; Л., С. 152–176. Bernart, Miloš (2010). Raně středověké přílby, zbroje a štíty z Českých zemí, Praha: Univerzita Karlova. Bernart, Miloš (2013). Raně středověká lamelová zbroj z lokality Horné Plachtince. In: Zborník Slovenského národného múzea, Roč. 107, č. 23, Bratislava, s. 91–96. Bernart, Miloš – Bravermanová, Milena – Ledvina, Petr (2014). Arma sancti Venceslai: nová zjištění o přilbě, zbroji a meči zv. Svatováclavské. Miloš Bernart, Milena Bravermanová, Petr Ledvina. In: Časopis Společnosti přátel starožitností, Roč. 122, č. 3, s. 179–182. Evans, Angela Care (1994). The Sutton Hoo Ship Burial, London. Kavánová, Blanka (2003). Mikulčice – pohřebiště v okolí 12. kostela. In: N. Profantová – B. Kavánová (ed. 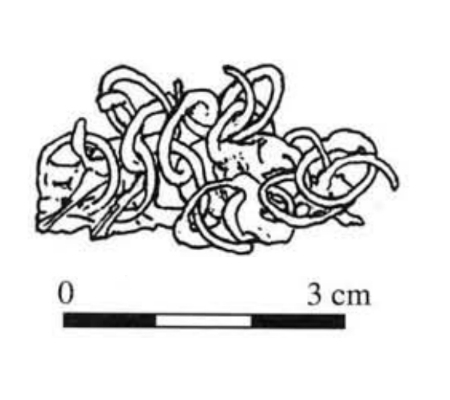 ): Mikulčice – pohřebiště u 6. a 12. kostela, Spisy Archeologického ústavu AV ČR Brno 22, Brno, s. 211–413. Kempke, Torsten (1991). Starigard/Oldenburg. Hauptburg der Slawen in Wagrien, 3. Die Waffen des 8. – 13. Jahrhunderts, Neumünster. Kirpičnikov 1971 = Кирпичников А. Н. (1971). Древнерусское оружие: Вып. 3. Доспех, комплекс боевых средств IX—XIII вв., АН СССР, Москва. Kola, Andrzej – Wilke, Gerard (2000). Mosty sprzed tysiąca lat. Archeologiczne badania podwodne przy rezydencji pierwszych Piastów na Ostrowie Lednickim, Toruń. Kouřil, Pavel (ed.) (2014). Velká Morava a počátky křesťanství, Archeologický ústav AV ČR, Brno. Kubarev, Gleb V. (1997). Der Panzer eines alttürkischen Ritters aus Balyk-Sook. In: Eurasia Antiqua 3, s. 629–645. Pieta, Karol (2015). Včasnostredoveké mocenské centrum Bojná – výskumy v rokoch 2007–2013 [Early medieval center Bojná – excavations in 2007–2013]. In: K. Pieta – Z. Robak (ed. ): Bojná 2 – Nové výsledky výskumov včasnostredovekých hradísk, Nitra, s. 9–49. Pleiner, Radomír (2002). Metalografický výzkum velkomoravské kroužkové zbroje z Břeclavi-Pohanska. In: Sborník prací Filozofické fakulty brněnské univerzity, M vol. 7, s. 77–81. Russell Robinson, H. (1975). Armour of Imperial Rome, London. Samokvasov 1908 = Самоквасов, Д.Я. (1908). Могилы Русской земли, Москва. Samokvasov 1916 = Самоквасов, Д.Я. (1916). Могильные древности Северянской Черниговщины, Москва. Schránil, Josef (1934). O zbroji sv. Václava. In: Svatováclavský sborník na památku 1000. výročí smrti knížete Václava svatého. I – Kníže Václav svatý a jeho doba, Praha, s. 159–172. Sizov 1902 = Сизов В. И. (1902). Курганы Смоленской губернии I. Гнездовский могильник близ Смоленска. Материалы по археологии России 28, Санкт-Петербург. Straub, Péter (1999). Újabb adalék a Keszthely-kultúra eredetéhez egy fenékpusztai sír kapcsán. – Ein neuer. Beitrag zum Ursprung der Keszthely-Kultur anhand eines Grabes von Fenékpuszta. In: Zalai Múzeum 9, s. 181–193. Thunmark-Nylén, Lena (1995). Die Wikingerzeit Gotlands I : Abbildungen der Grabfunde, Stockholm. Thunmark-Nylén, Lena (2000). 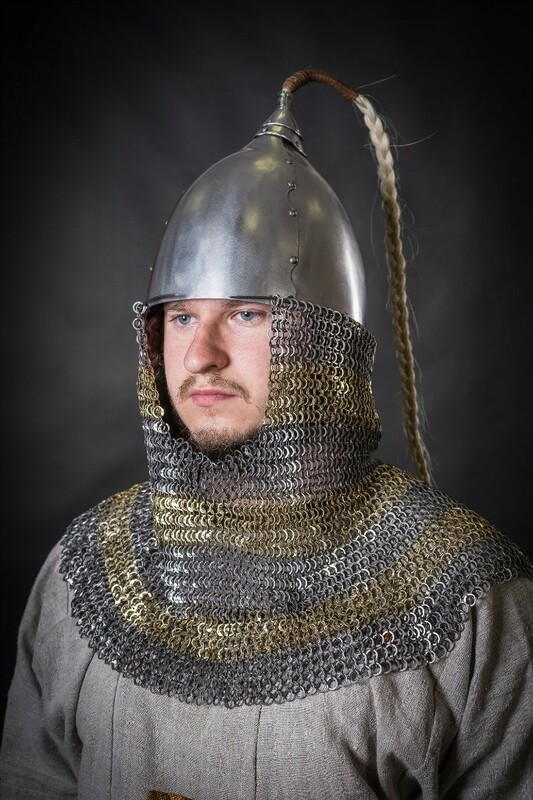 Die Wikingerzeit Gotlands IV:1–3 : Katalog, Stockholm. Tweedle, Dominic (1992). 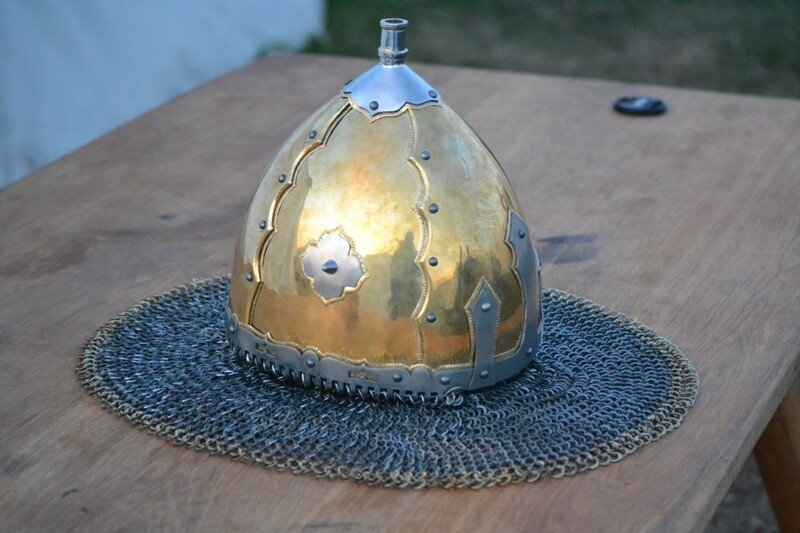 The Anglian Helmet from 16-22 Coppergate, The Archaeology of York. The Small Finds AY 17/8, York. Vike, Vegard (2000). 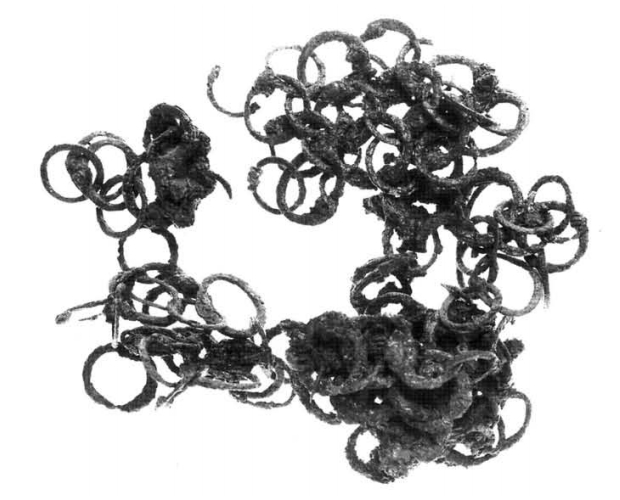 Ring weave : A metallographical analysis of ring mail material at the Oldsaksamlingen in Oslo, Oslo [vysokoškolská práce]. 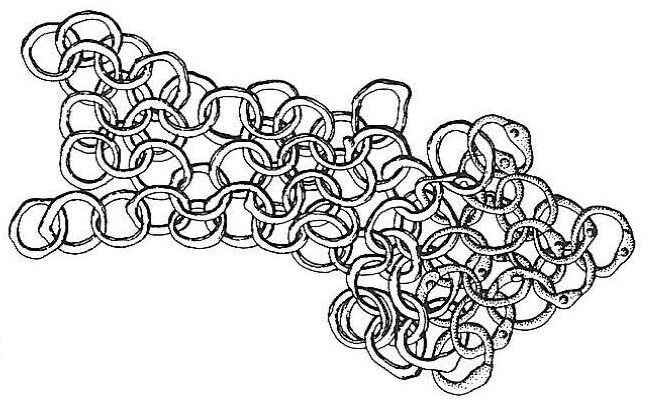 Dostupné z: http://folk.uio.no/vegardav/brynje/Ring_Weave_Vegard_Vike_2000_(translated_Ny_Bj%C3%B6rn_Gustafsson).pdf. V dalším článku o mečích bychom rádi představili doposud nepříliš známý Petersenův typ W. Nakolik víme, tento typ meče byl v České republice doposud rekonstruován pouze dvakrát. V následujícím článku tento zajímavý typ popíšeme, zmapujeme a odhalíme i jeho rekonstrukce. Typ W označuje meč, jehož jílec má komponenty – tedy jednodílnou hlavici a záštitu – odlité z bronzu. Záštita je z čelního pohledu rovná, s mírně zaoblenými kratšími stranami. Jednodílná hlavice, na jejíž horní straně je roznýtován řap, má jednoduchý, půlkruhový tvar se zaoblenými hranami. Při pohledu shora je tvar obou komponentů čočkovitý, tj. ke krajům se zužující. Oba bronzové komponenty byly zhotovovány duté (viz rentgen), a to do té míry, že bronz tvoří tenkou, uvnitř dutou skořápku. Všechny známé kusy mají charakteristickou dekoraci bronzových komponentů; hlavice je sériemi linek členěna do čtyř polí, které jsou vyplněné cikcakovým vzorem. Tento vzor je dobře patrný i na záštitách; ve dvou případech je záštita zdobena soustřednými kroužky (Nedošivina 1991: 166). Dekorace se zdá být odlitá, ačkoli dělící a ohraničující linie mohly být dodatečně zvýrazněny. Některé typy se projevují blyštivě zlatavou povrchovou úpravou. Členění hlavice navazuje na typy E a Y a souvisí s typy U, V a některých exemplářích typu X. Datace spadá do 10. století. Norské kusy lze datovat do 1. poloviny 10. století (Petersen 1919: 157). Do tohoto období se datuje také Petersenův typ O, který má rovněž bronzové komponenty a může být ovlivněn stejným trendem. Ve východní Evropě lze typ W objevit v hrobech datovaných do 2. poloviny 10. století (Nedošivina 1991: 166). Detail bronzových komponentů meče typu W. Nález objevený roku 1816 na neznámé norské lokalitě (B998). Autor: Svein Skare, Unimus. Jílec typu W je vždy součástí dvoubřitého meče. Meče tohoto typu mají poměrně uniformní rozměry. Kompletní meče jsou dlouhé 878–930 mm, přičemž délka čepele se vždy pohybuje kolem 745-760 mm. Čepele jsou široké 50–60 mm a jsou zanořené do připravených drážek na spodních stranách záštit. Čepele jsou obvykle bez nápisů, ačkoli meč z Timereva (hrob 100) má na čepeli jasně čitelné latinské písmeno C (Nedošivina 1991: 166). Záštity dosahují délky 80–100 mm, výšky 12–18 mm a tloušťky 17–22 mm. Dochované hlavice mají délku 58–67 mm, výšku 34–37 mm a tloušťku 19–21 mm (Androščuk 2014: 79–80 a vlastní pozorování). Rukojeti jsou dlouhé 85–105 mm, což odpovídá průměrným šířkám dlaní a svědčí o výrobě na míru. Byli jsme schopni nalézt pouze čtyři kusy se zachovanými rukojetěmi; ve třech případech je řap tvořící rukojeť obložen dřevěným základem, který je v případě meče z norského Breivoldu (T3107) dodatečně potažený plátnem a spirálovitě obtočený železným drátem. Čtvrtý případ, a sice meč z Kleppu (S2453), má rukojeť parohovou. Co se týče pochev, lze předpokládat, že nabývaly standardních podob. Meč z Kleppu má zachovanou dřevěnou pochvu s koženým potahem, zatímco meč z Timereva (hrob 100) je na kresebné rekonstrukci pokryt fragmenty dřevěné pochvy (Nedošivina 1991: Рис. I.I). Na konci meče ze Šestovice se zachovalo bronzové nákončí. Detail zachovalého jílce meče z Breivoldu (T3107). Autor: Ole Bjørn Pedersen, Unimus. Bikavėnai, Litva. Celková délka 930 mm, šířka čepele 50 mm, délka rukojeti 105 mm, délka záštity 85 mm, výška záštity 18 mm. Dřevěné kusy rukojeti. Foto a popis: Kazakevičius 1996: 64–67. Östveda, Švédsko (SHM 25370). Celková délka 878 mm, délka čepele 743 mm, šířka čepele 50–31 mm, délka záštity 100 mm, výška záštity 14 mm, tloušťka záštity 22 mm, délka hlavice 60 mm, výška hlavice 37 mm, tloušťka hlavice 20 mm, délka rukojeti 86 mm, šířka rukojeti 20–26 mm, celková váha 892 g. Foto a popis: Androščuk 2014: 79, 337–338, Fig. 35. Šestovica, hrob 42, Ukrajina. Celková délka 890 mm, celková délka jílce 145 mm, šířka čepele 60 mm, délka záštity 85 mm, výška záštity 17 mm, délka hlavice 60 mm, výška hlavice 35 mm. Hrot meče opatřen nákončím. Foto a popis: Androščuk – Zocenko 2012: 212, Fig. 151; Jana Korkodim, Wojtek Szanek. Klepp (S2453), Norsko. Celková délka 899 mm, celková délka jílce 139 mm, délka čepele 760 mm, šířka čepele 58 mm, délka záštity 100 mm, výška záštity 12 mm, tloušťka záštity 21 mm, délka hlavice 59 mm, výška hlavice 36 mm, tloušťka hlavice 21 mm, délka rukojeti 91 mm. Autor: Unimus. Obecně vzato typ W nemá mezi evropskými meči příliš velké zastoupení – v současné době evidujeme 19 kusů. Distribuce je však zajímavá a zaslouží si pozornost. Není překvapivé, že nejvyšší počet známe z Norska. Zatímco Petersen znal 8 norských mečů typu W (Petersen 1919: 156), Hernæs jich zná již devět a tento počet se zdá být stále aktuální (Hernæs 1985). Pouze čtyři z nich mají částečně zachované čepele, zbytek tvoří jílcové komponenty. Ve Švédsku známe jeden meč a dva jílcové komponenty (Androščuk 2014: 79). Dva komponenty – jednu hlavici a jednu záštitu – známe z německého Šlesvicka (Geibig 1991: Tab. 164:4–5). Dva zástupce známe z Timereva v Rusku (hroby 100 a 287), kde nalezneme jeden kompletní meč a jeden fragment hlavice (Nedošivina 1991: 166–167, Рис. I.I). Jeden kompletní meč známe z litevské lokality Bikavėnai (Kazakevičius 1996: 64–67) a jeden meč z ukrajinské Šestovice (Androščuk – Zocenko 2012: 212). Poslední exemplář – typicky dekorovaný fragment hybridní varianty typu W s dvoudílnou hlavicí odlitou z bronzu – byl nalezen roku 2015 při sídlištním výkopu v moravském Pohansku a zůstává prozatím nepublikován (osobní diskuze s Jiřím Koštou). Přestože někteří autoři uvádějí také nálezy z Velké Británie (Jakobsson 1992: 213; Żabiński 2007: 65), je potřeba poukázat, že všechny tyto meče mají železné komponenty, takže nesplňují základní kritérium typu W.
Z celkového počtu 19 kusů tvoří 8 meče či jejich fragmenty, zatímco zbývajících 11 představuje tvoří oddělené bronzové komponenty. Meče typu W byly nalezeny v 7 zemích, jsou tedy poměrně rozptýleny v porovnání s celkovými počty. Hlavní nálezovou oblastí je severní a východní Evropa, kde se meče nacházejí na významných lokalitách. Distribuce typu W podle Jakobssona (1992: 228). V této kapitole bychom chtěli představit čtyři zdařilé rekonstrukce Petersenova typu W, které zhotovili různí evropští mečíři. Šířka čepele 68–40 mm. Váha 1540 gramů, vyváženo 170 mm od záštity. Rekonstrukce meče ze Šestovice 42. Váha 1200 gramů. Rekonstrukce meče ze Šestovice 42 v porovnání s originálem. Výrobce: Petr Floriánek, Radek Lukůvka, 2018. Tato práce vznikla díky podnětu Tomáše Břenka ze skupiny Goryničové, který vlastní rekonstrukci vyrobenou Tomášem Zelou. Jelikož tento typ nebyl na českých bojištích dosud k vidění, vznikla potřeba poukázat na nálezy a jejich rozšíření. Poděkování si zaslouží každý vytrvalý zájemce, který se nenechal odradit vyčkáváním. Své zásluhy na článku má také Sergej Kainov, který poukázal na dva ruské nálezy, a Ferenc Tavasz, který mi vypomohl svými radami. Článek bych chtěl konečně věnovat svému příteli, mečíři Janu Motyčkovi a jeho potomkovi, který právě přichází na tento svět. Androščuk, Fedir – Zocenko, Vladimir = Андрощук Ф. O. – Зоценко В. (2012). Скандинавские древности Южной Руси: каталог, Paris. Hernæs, Per (1985). De østnorske sverdfunn fra yngre jernalder : en geografisk analyse. Magistergradsavhandling i nordisk arkeologi – Universitetet i Oslo, Oslo. Jakobsson, Mikael (1992). Krigarideologi och vikingatida svärdstypologi, Stockholm : Stockholms Universitet. Petersen, Jan (1919). De Norske Vikingesverd: En Typologisk-Kronologisk Studie Over Vikingetidens Vaaben. Kristiania. Nedošivina N. G. = Недошивина Н. Г. (1991). Предметы вооружения, снаряжение всадника и верхового коня тимеревского могильника // Материалы по средневековой археологии Северо-Восточной Руси, Москва: 165–181.